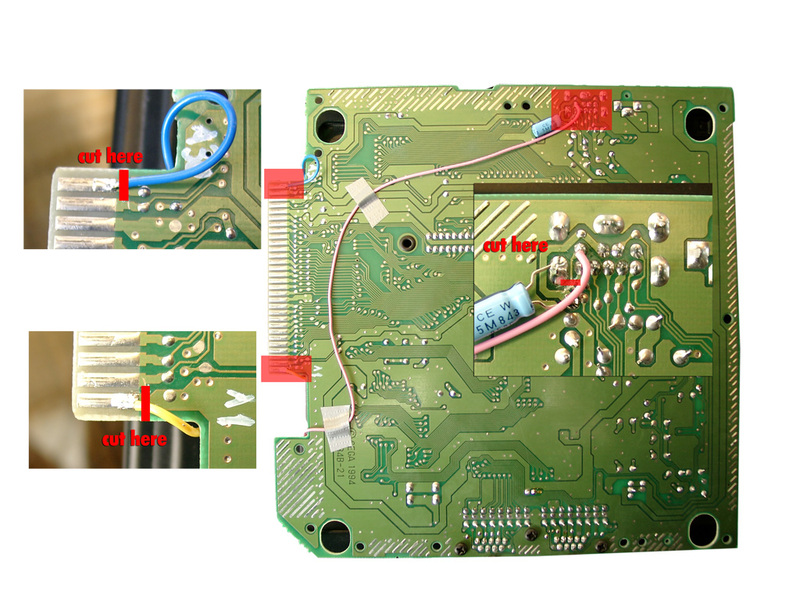 Today I have to make a switchless mod for the good old Mastersystem in its original form. 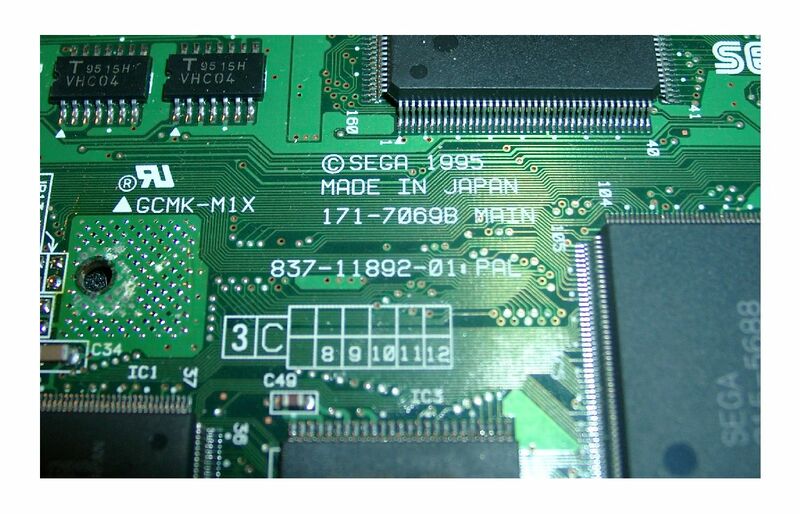 No problem for me, after changing sebs code for Mastersystems few months ago. You have to remove the original 5mm LED and replace it with a RGB-Led with common plus like this one. 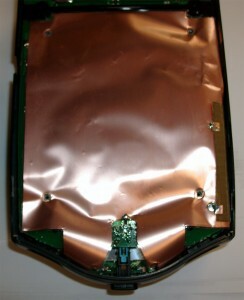 The resistors of the LED: 220Ohm. 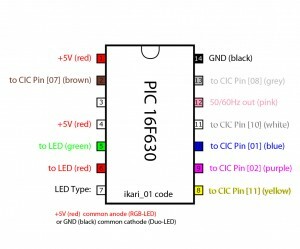 You can use higher ones, if the light is to bright. 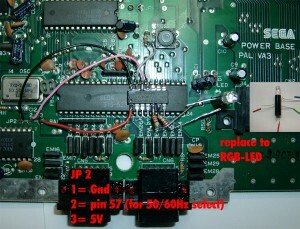 If you press the reset button longer the Led toggles between red and green. Thanks to Maximilian Rehkopf alias ikari_01 we can proudly present a new switchless Mod for the SNES. 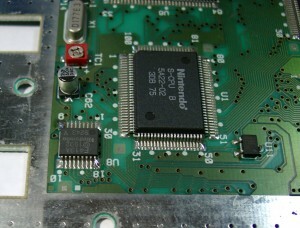 Today I am using a japanese SNES. 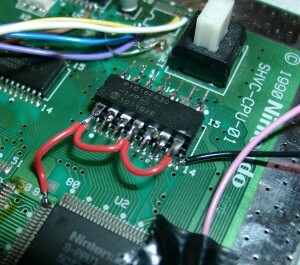 It works with a USA SNES too. 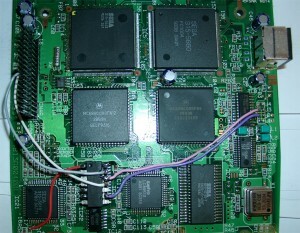 It has the same layout. 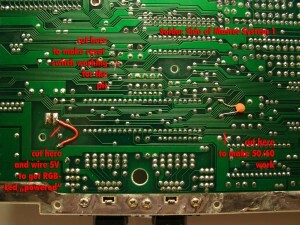 There are two ways to get the new CIC working. 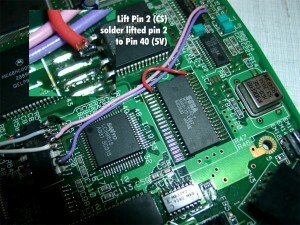 To get the supercic working you have to lift the following pins of the original CIC. 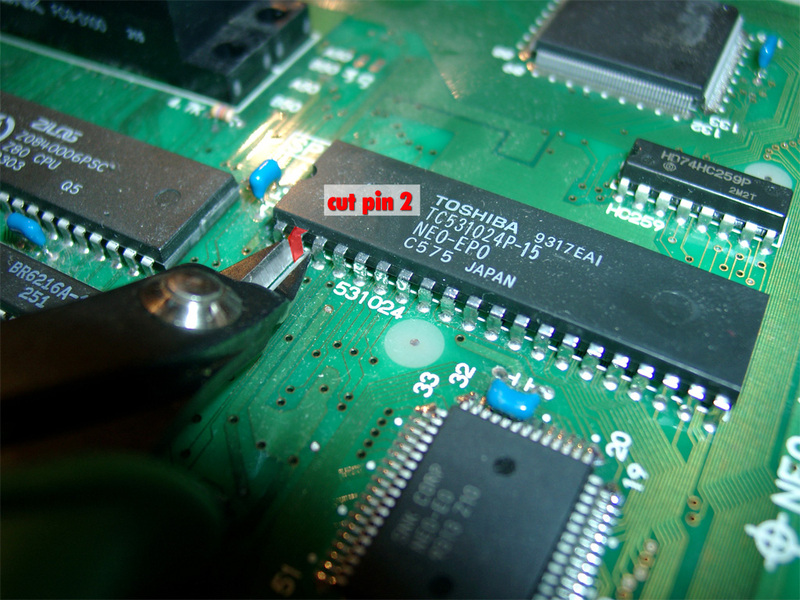 b) removing the original CIC and add a 10k from Pin 8 to GND. 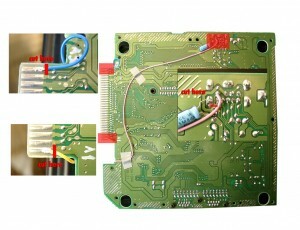 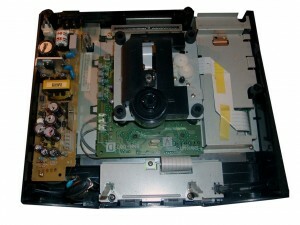 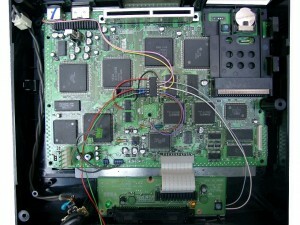 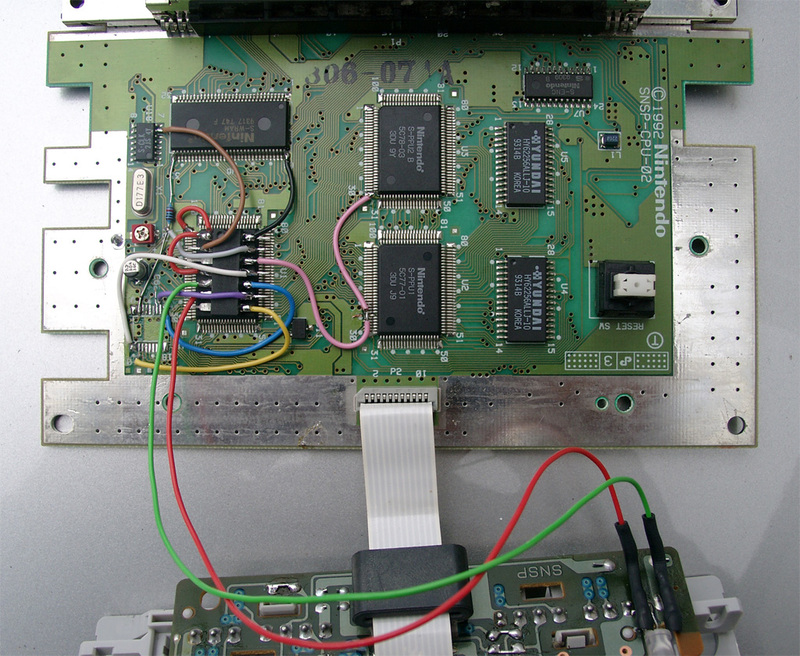 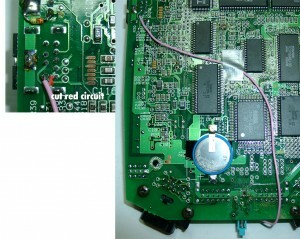 Remove the original CIC (here you can see some pictures of a PAL SNES. 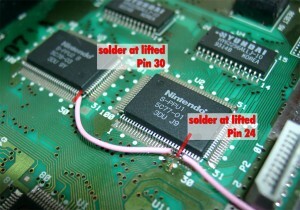 Its the same at the japanese/USA SNES. 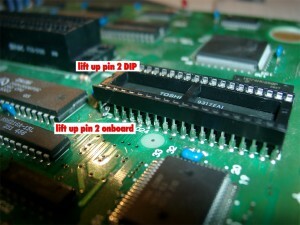 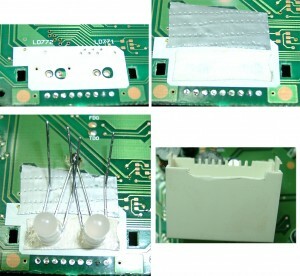 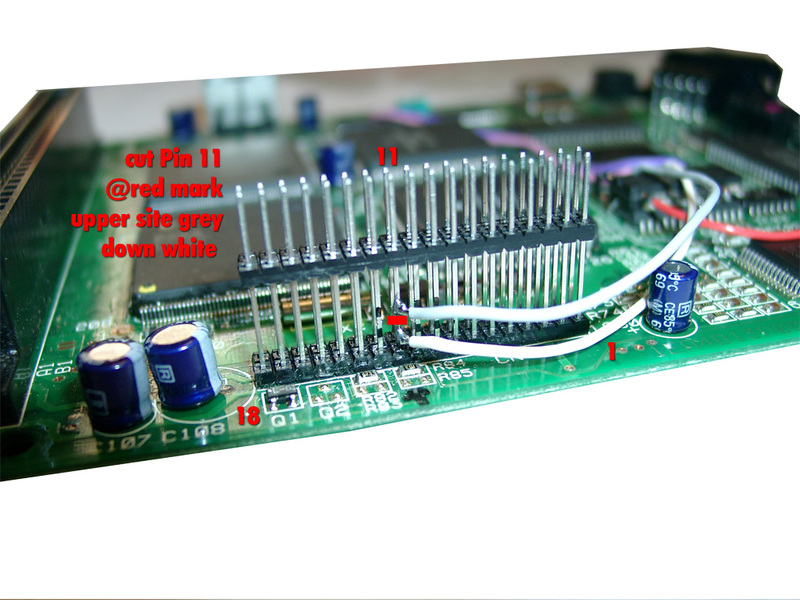 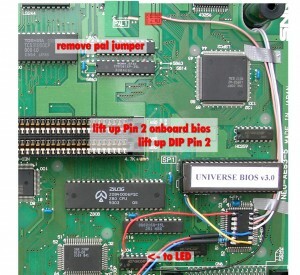 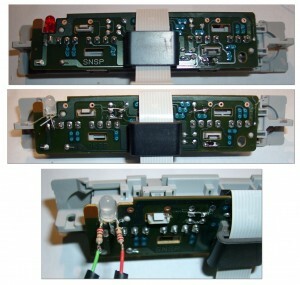 You have to lift PPU2 Pin 30 and lift PPU1 Pin 24 and wire it together to Pin 12 @Pic12f630. 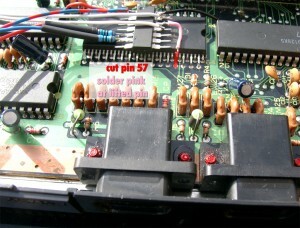 First we have to put some 5V at the PIC. 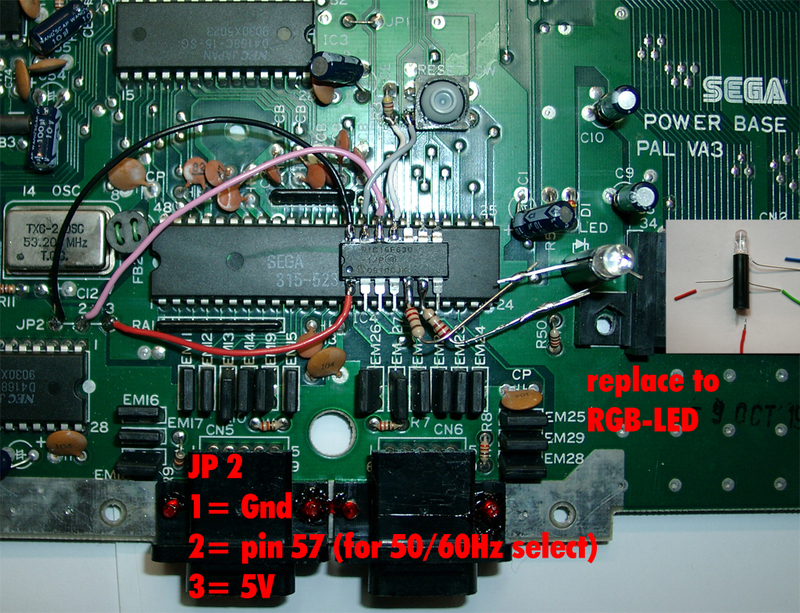 And please set Pin 7 To 5V (PIC is set to RGB-LED Mode (common anode). 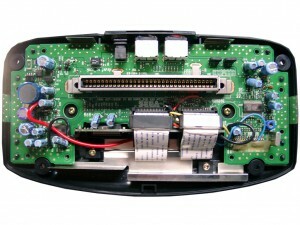 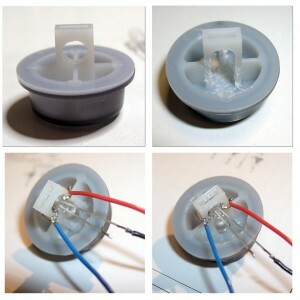 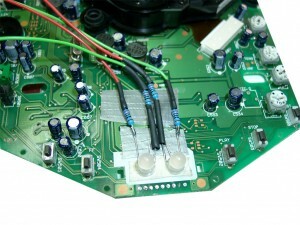 To do the LED Mod you have to remove the original LED at the controller port. 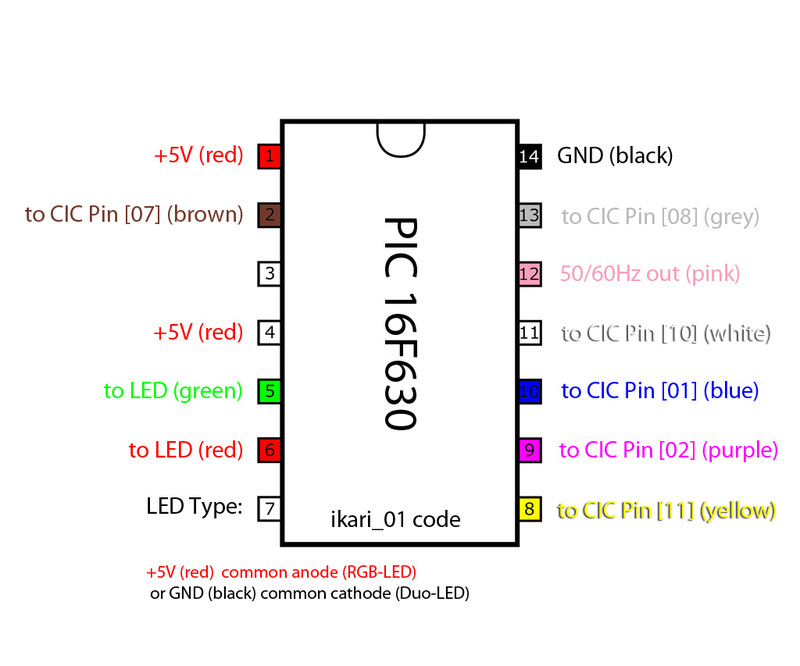 With a RGB Led you can choose 2 of the 3 colors you wish. 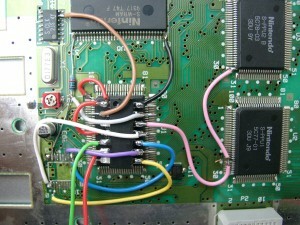 I am using the normal colors red and green. 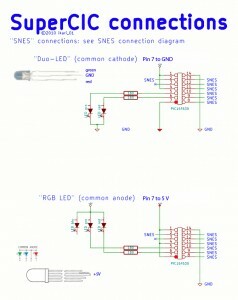 Some Info about the usage of the superCIC. 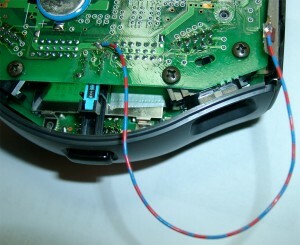 You can change between 50/60Hz and Auto Function by pressing the Reset Button for longer as around 0,5 sec. 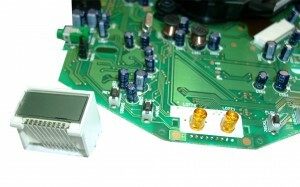 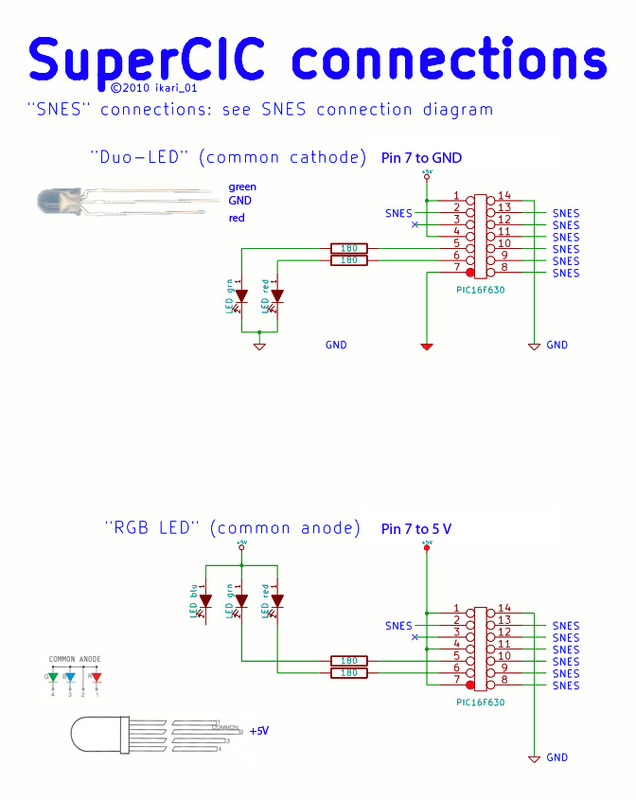 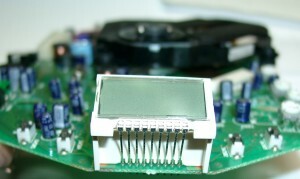 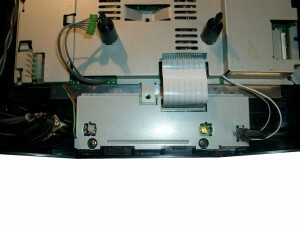 The current Status is shown by the DUO-LED. (red=60Hz, green 50Hz, orange=Auto). 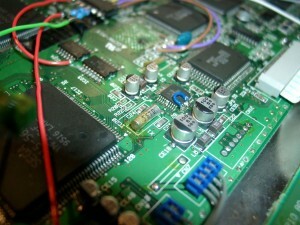 After releasing the Reset Button the mode will be active. 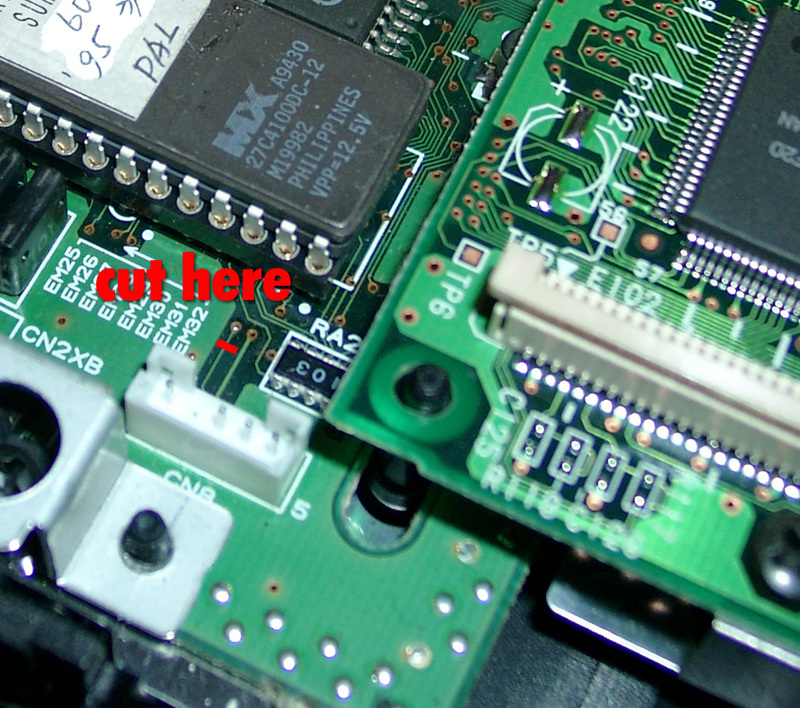 The SNES will not reset at this moment. 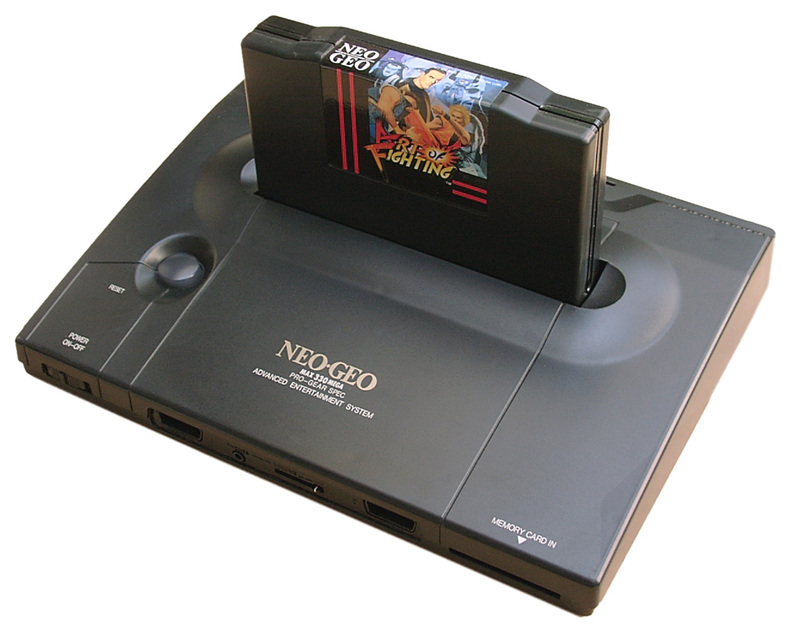 starting the Game in its native frequence. 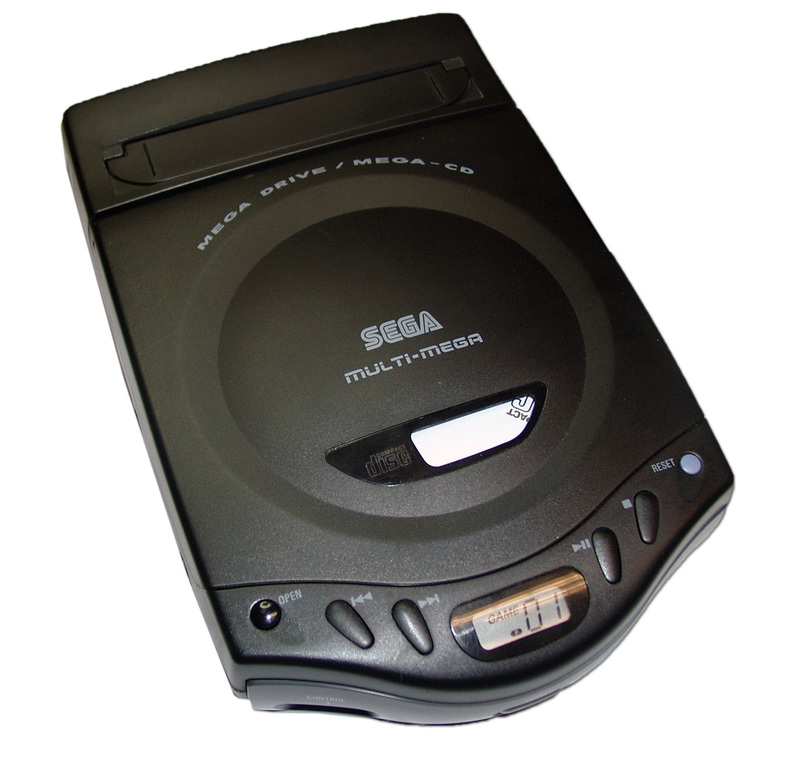 Today I got a PAL SMD1 Console. 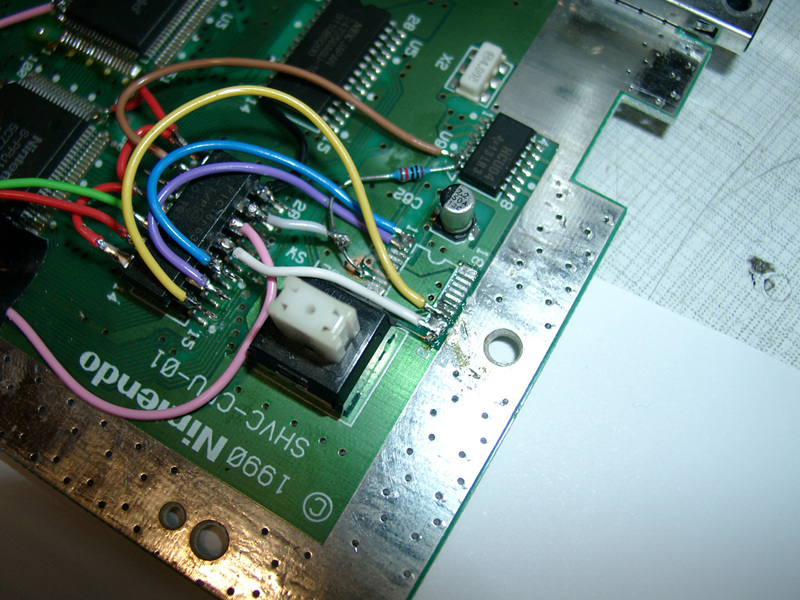 I tried sebs code as several times before to make a switchless mod. 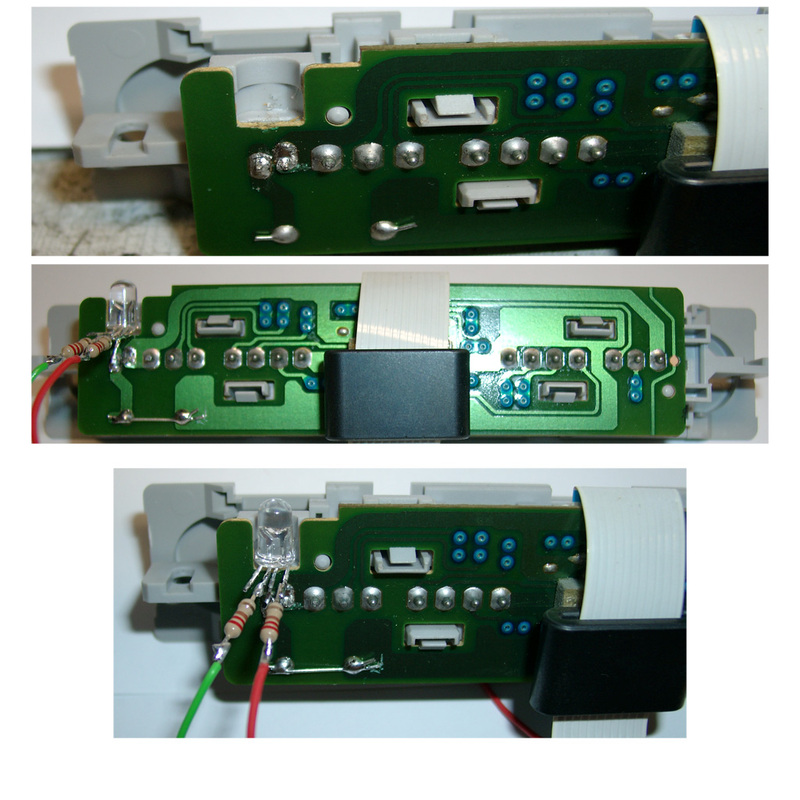 You have to cut 3 circuits and need a 3mm Duo-Led for displaying. I done the first modification at a PAL SNES, but it should work on US and japanese SNES too. 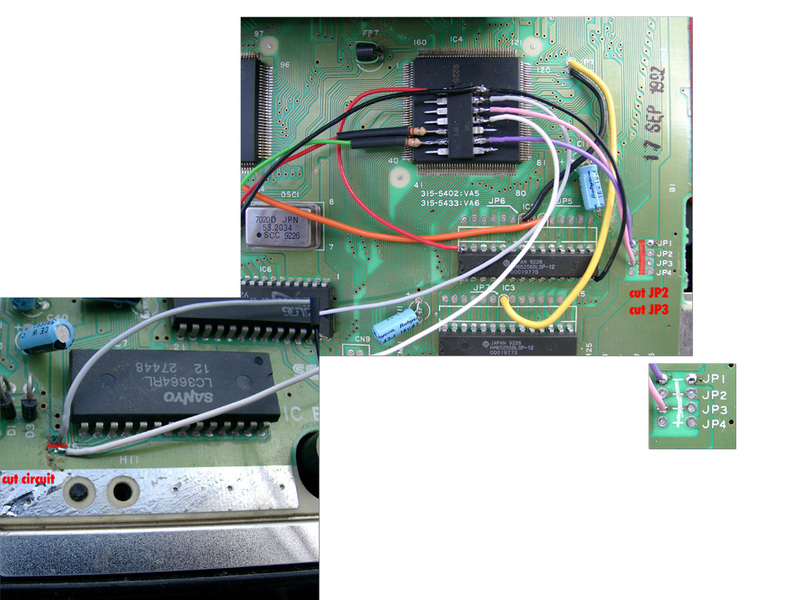 Sorry the Code here is a newer version, so you have to set PIN 7 of the PIC 16F630 to GND. 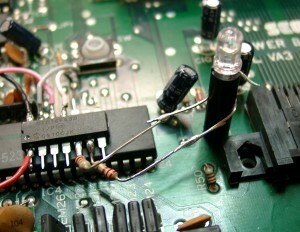 As here is described with a common cathode DUAL-LED! 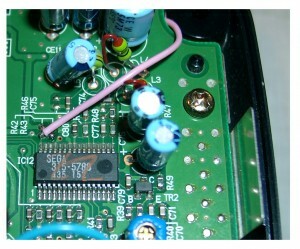 The following pictures will show way b). And please set Pin 7 To GND, so the PIC is set to DUO-LED Mode (common cathode). 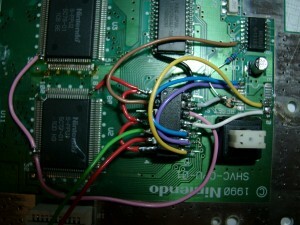 On the following picture the wire is missing! 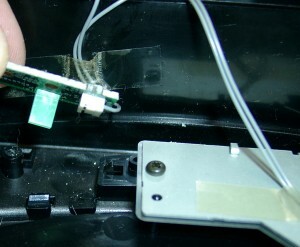 you can remove the original LED by heat both pins together and pull it a little bit out. So you can cut the 2 pins of the original LED. 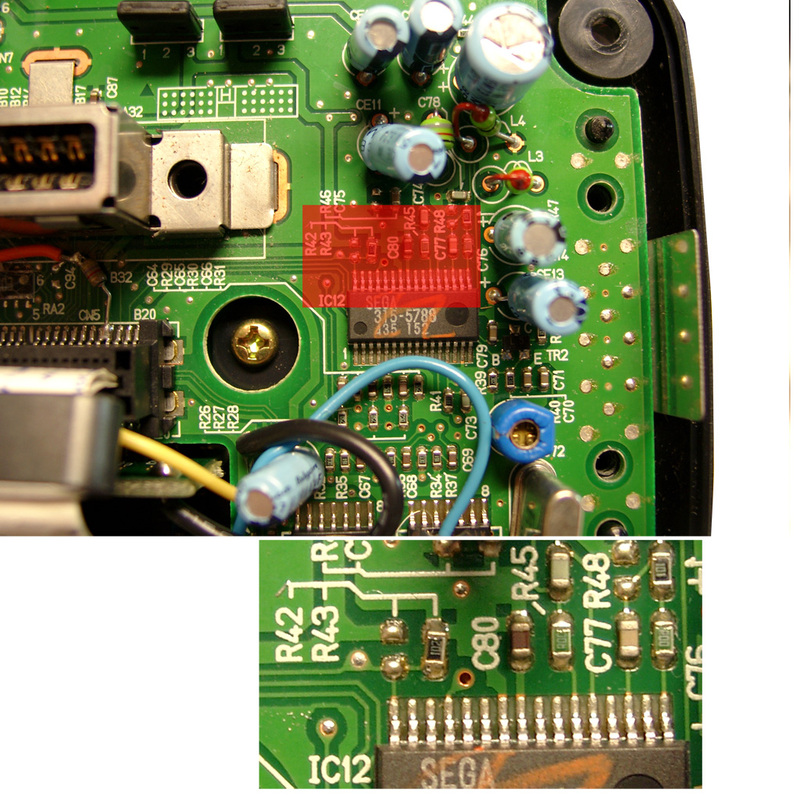 Today I modded a Sega Master System II. You can change between 50/60Hz via the “Pause” Button. 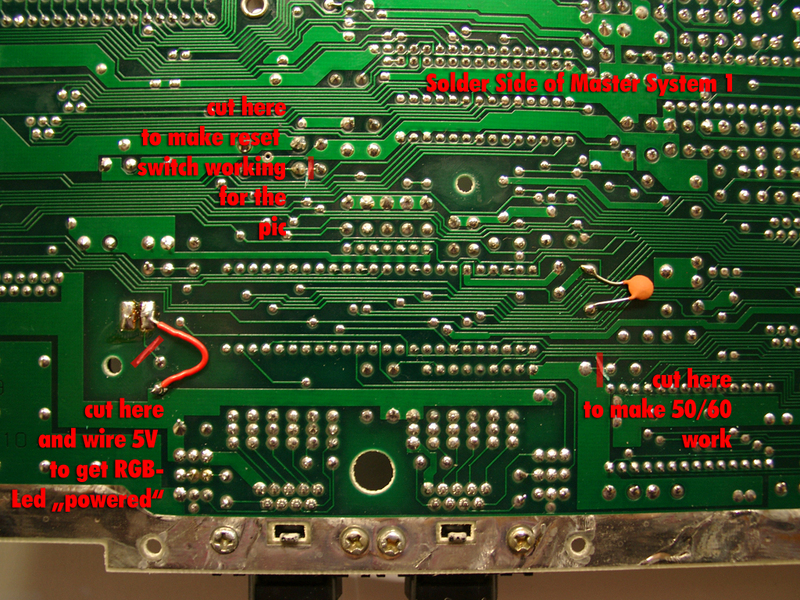 The normal function of the pause is still working if you press it a very short time. For working with sebs switchless mod, I done some modification on the code. b) reduce the code to two modes 50 and 60Hz. 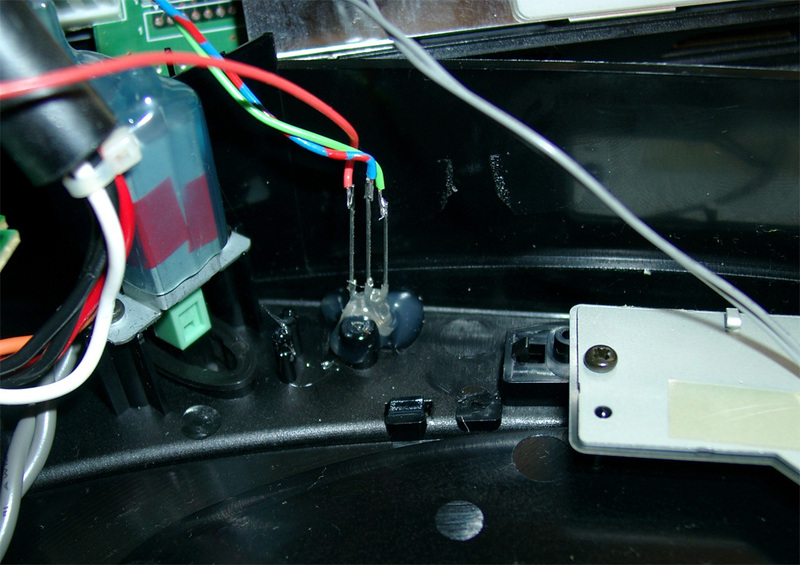 For Displaying the LED I put it under the Pause Button. 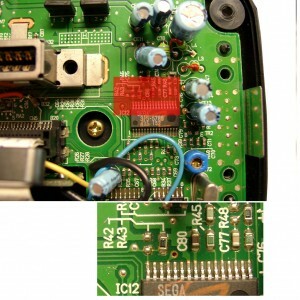 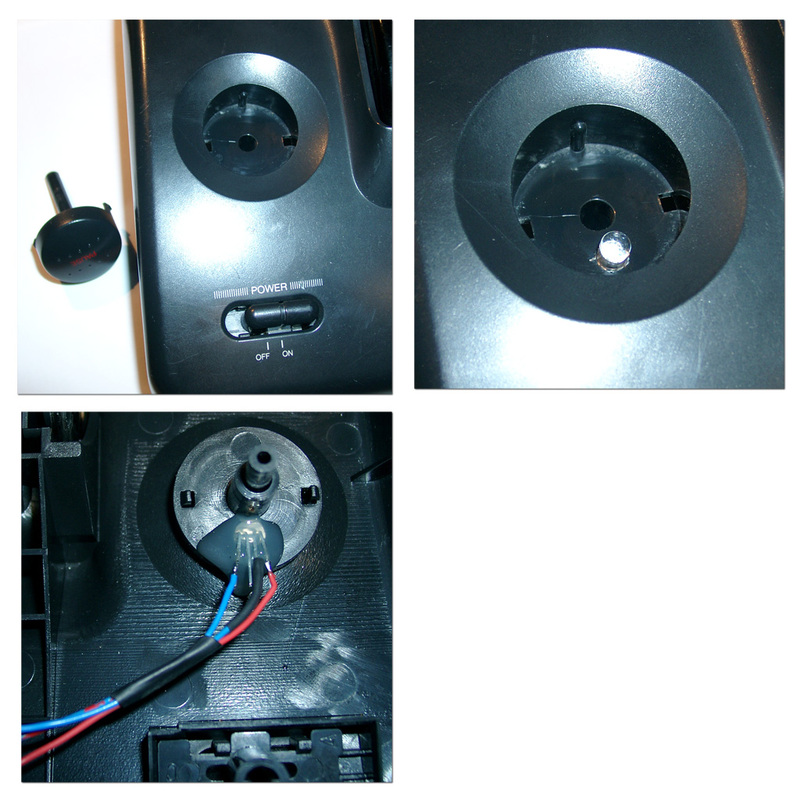 I want to make the ultimative Sega Genesis 2 switchless MOD including 32X and Sega CD2. 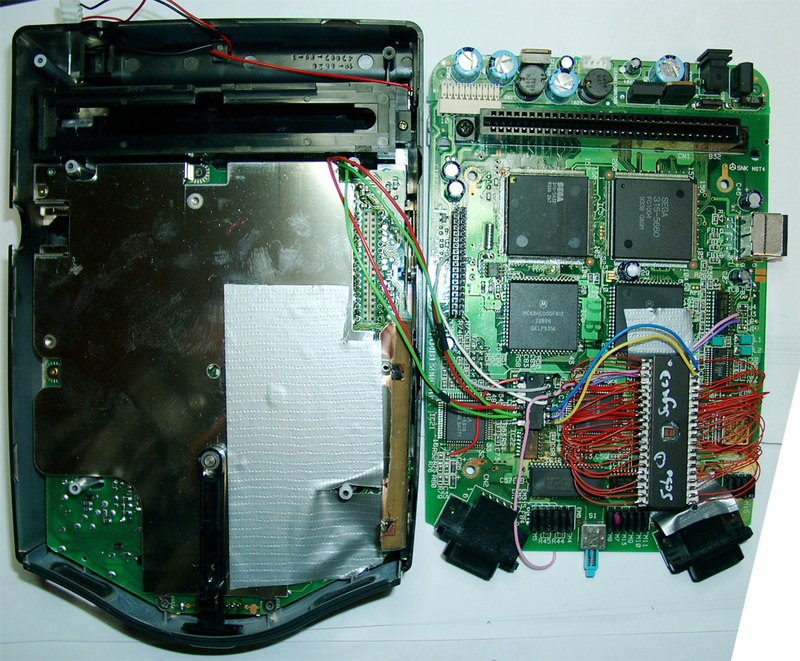 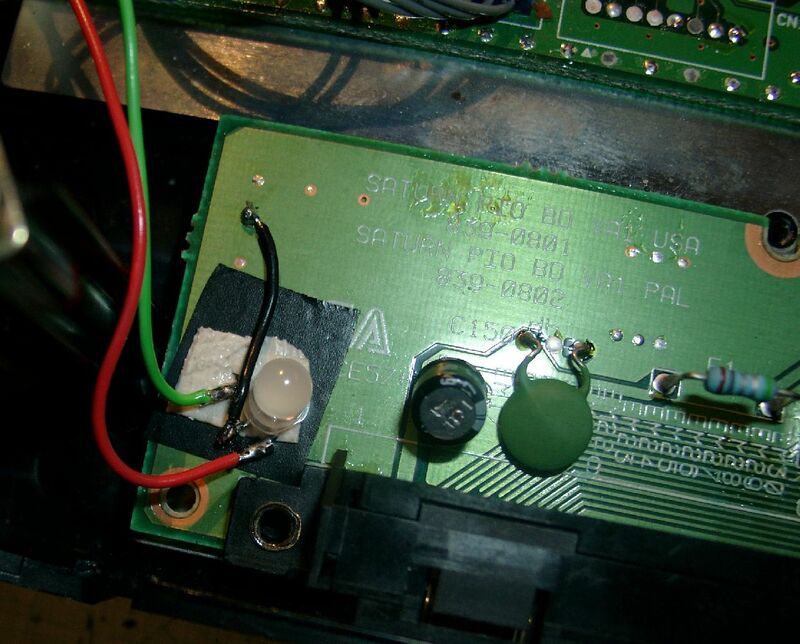 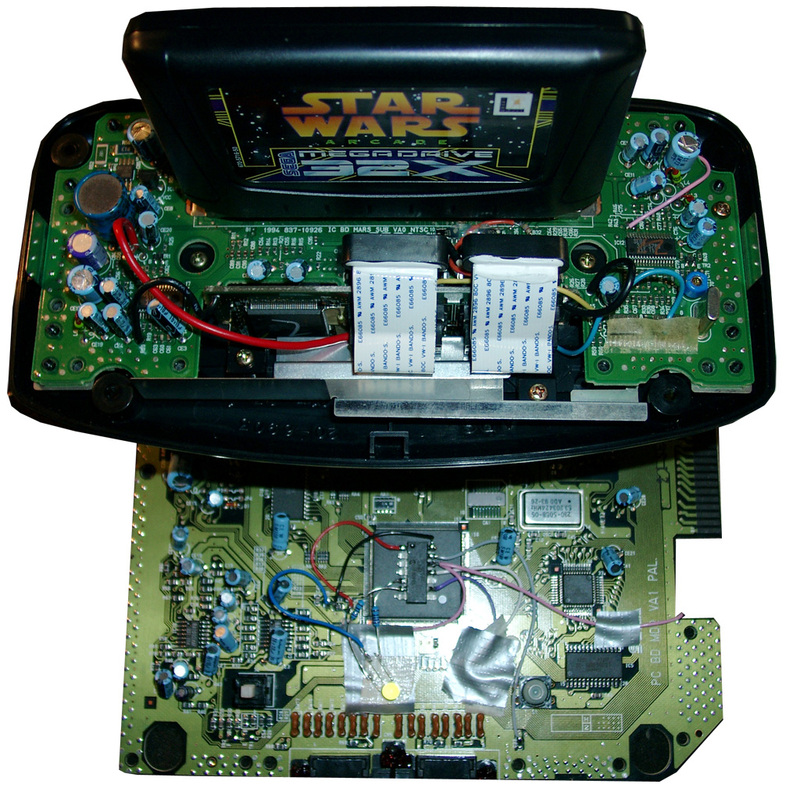 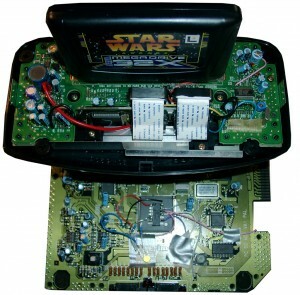 In the beginning we have to mod the Genesis 2 with the switchless mod, like I done before. 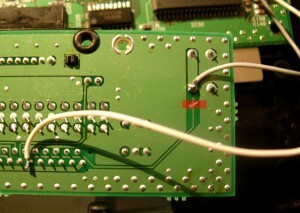 (Thanks to SEB for the great PIC Code). 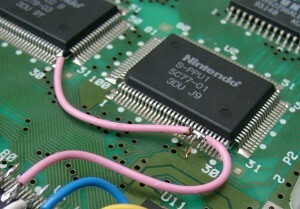 For making a 32X working you are in need of the pink wire. 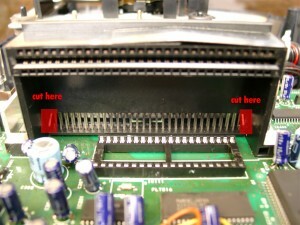 This signal is needed in the 32X. 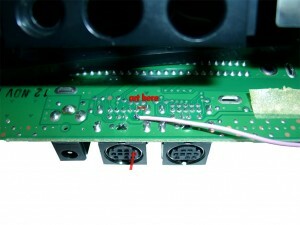 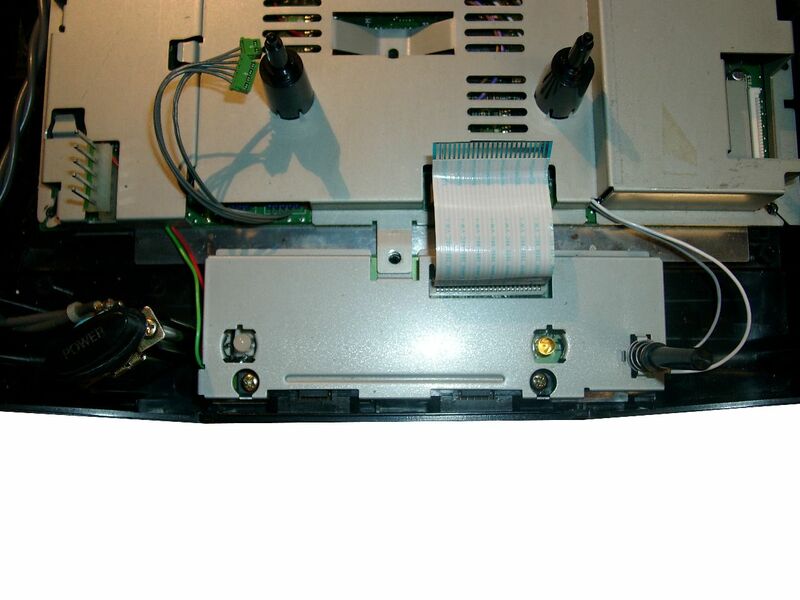 We can make use of the A/V connector cable between the Genesis 2 and the 32X. 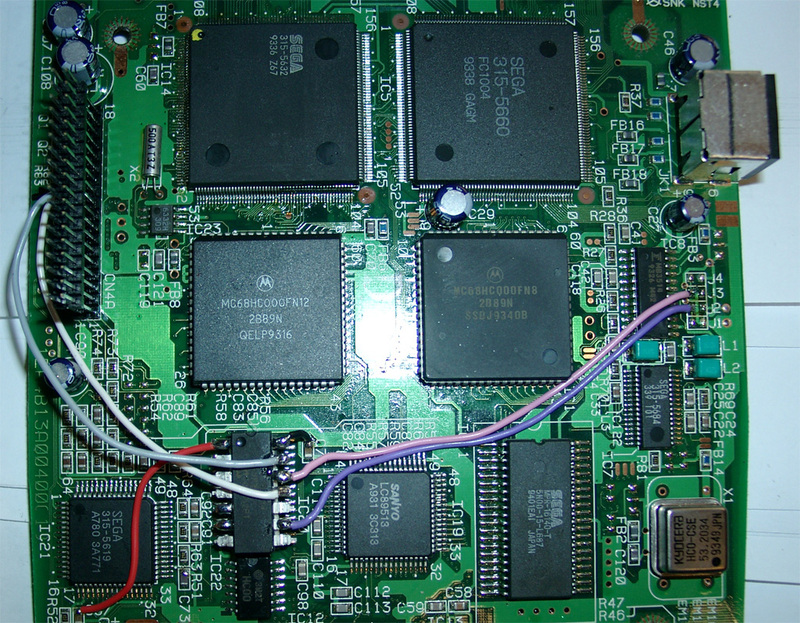 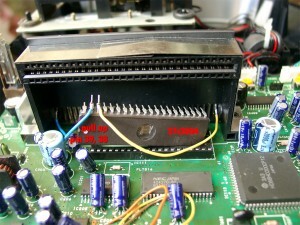 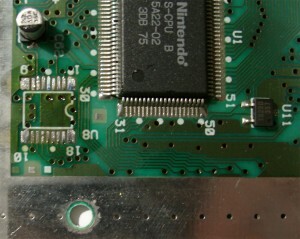 The Mono Audio Signal is not in use, so we can cut the original Mono signal at the Genesis 2 A/V connector and the 32X A/V connector. 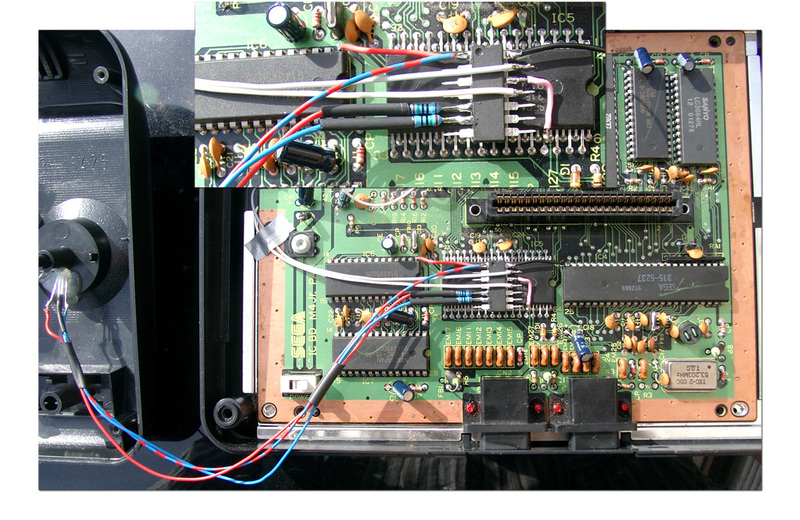 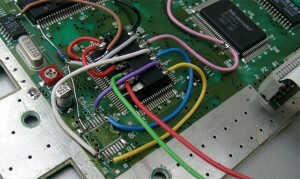 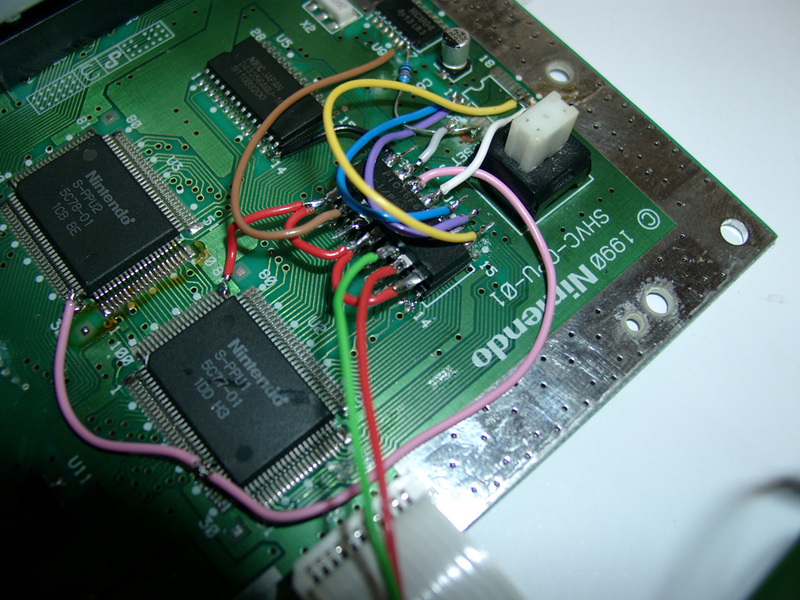 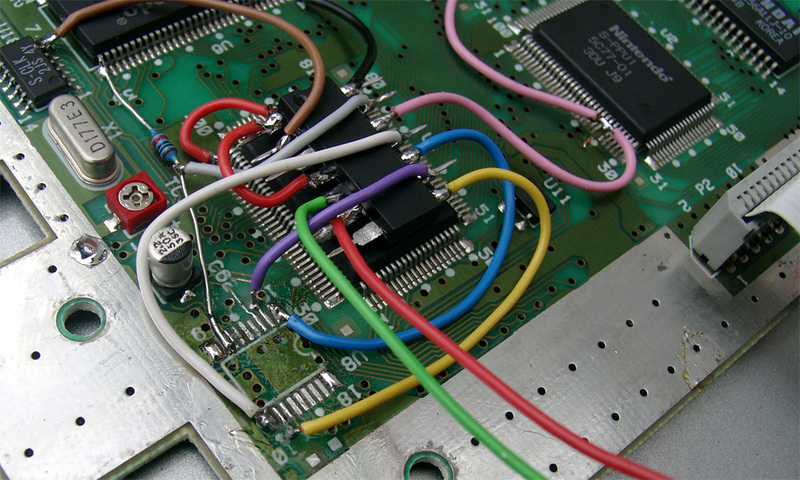 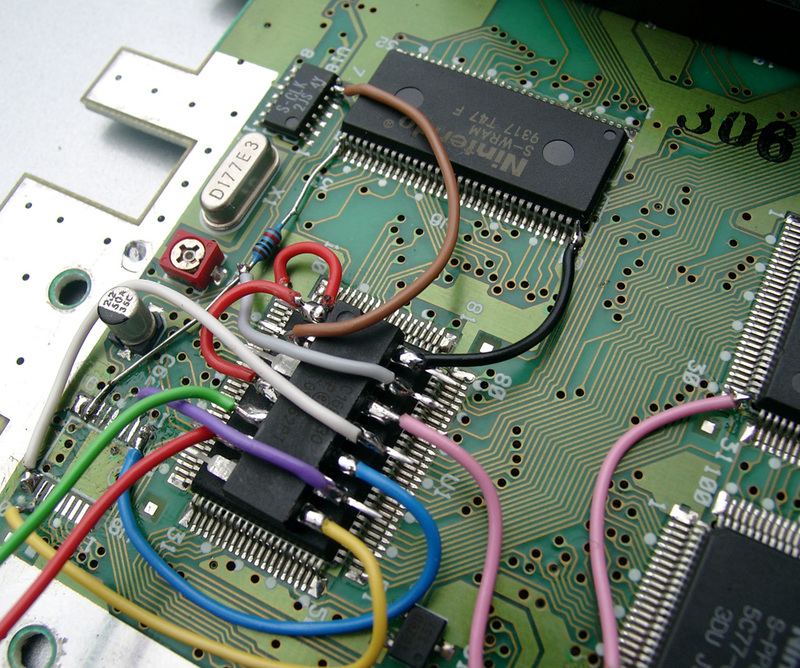 Here you will see the Sega Genesis 2 switchlees mod including the 3 more wires (yellow, blue, and pink). The Pink is needed for the 32x. Blue and yellow is needed if you want to make a Sega CD working too. 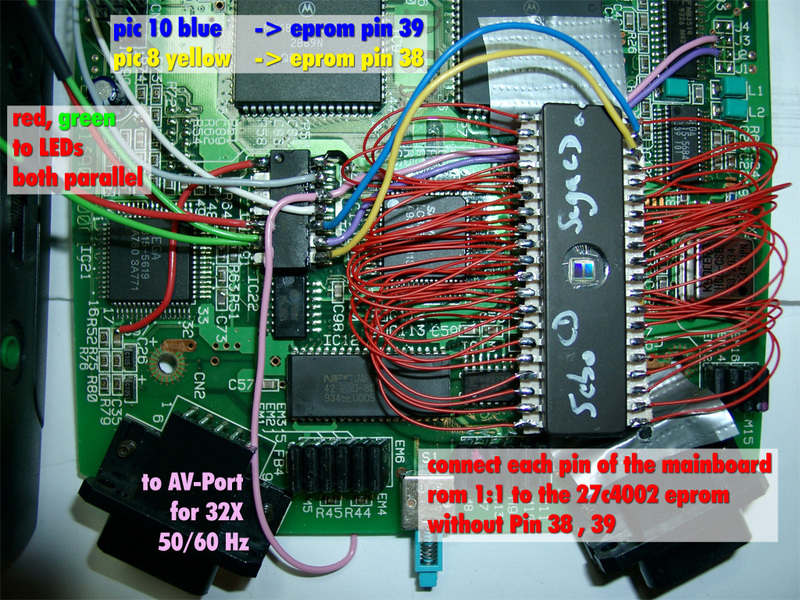 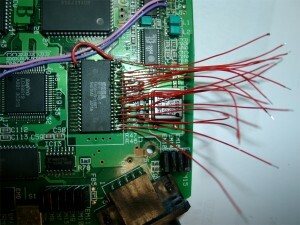 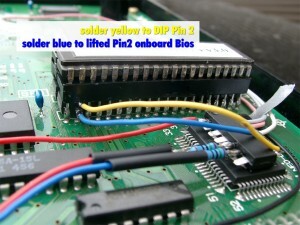 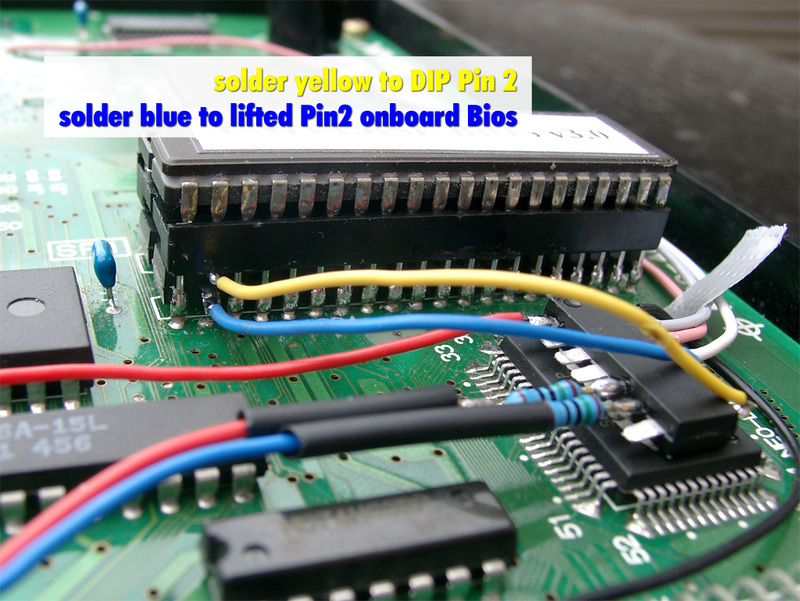 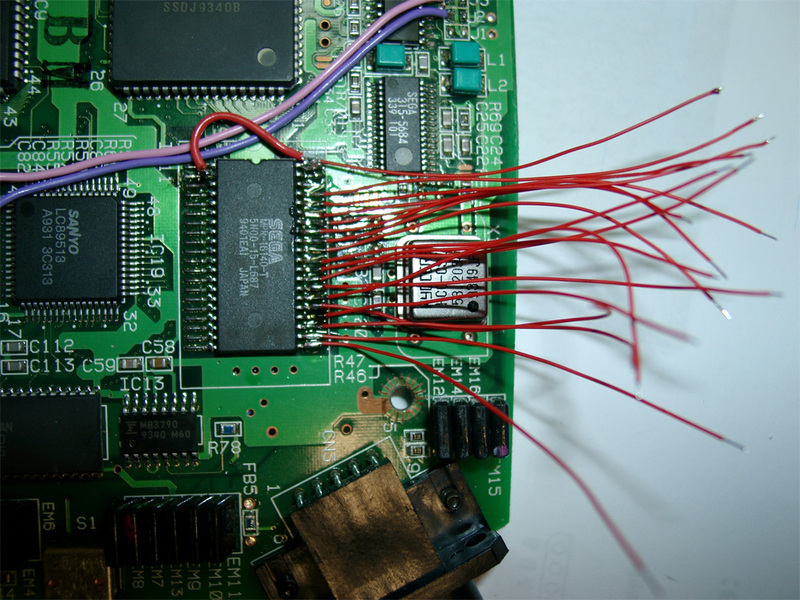 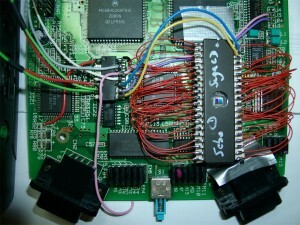 For 32X support add a 2nd pink wire to Pin 12 of the PIC. 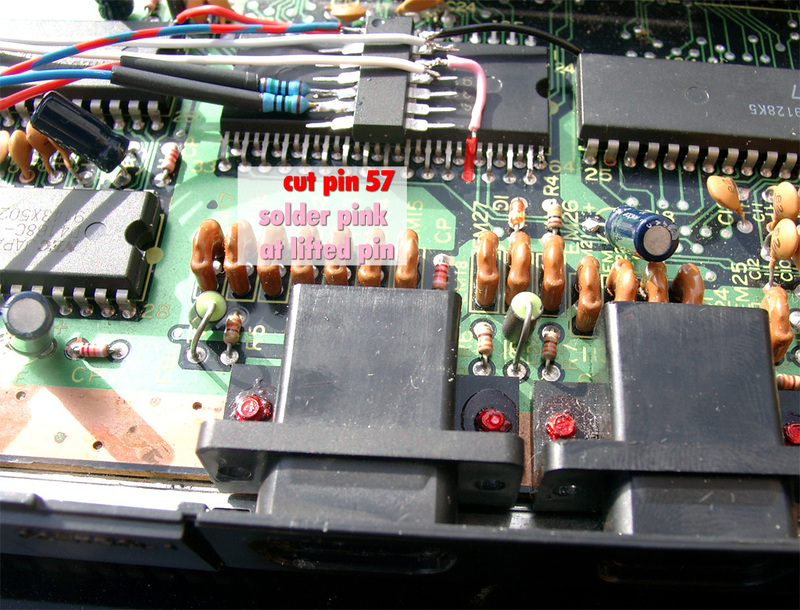 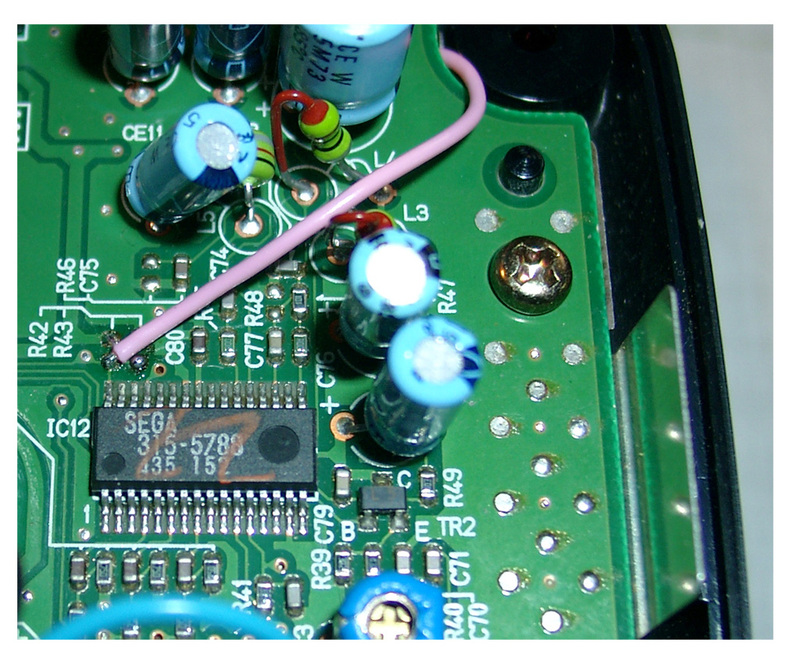 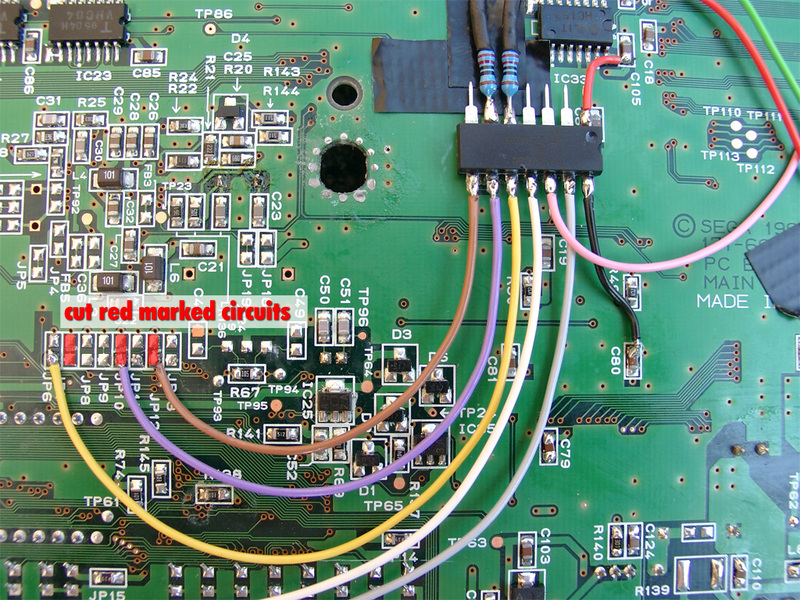 At the solder site you have to cut the cirquit path to Pin 6 of the A/V Port and solder the pink wire to Pin 6 of the A/V Port. 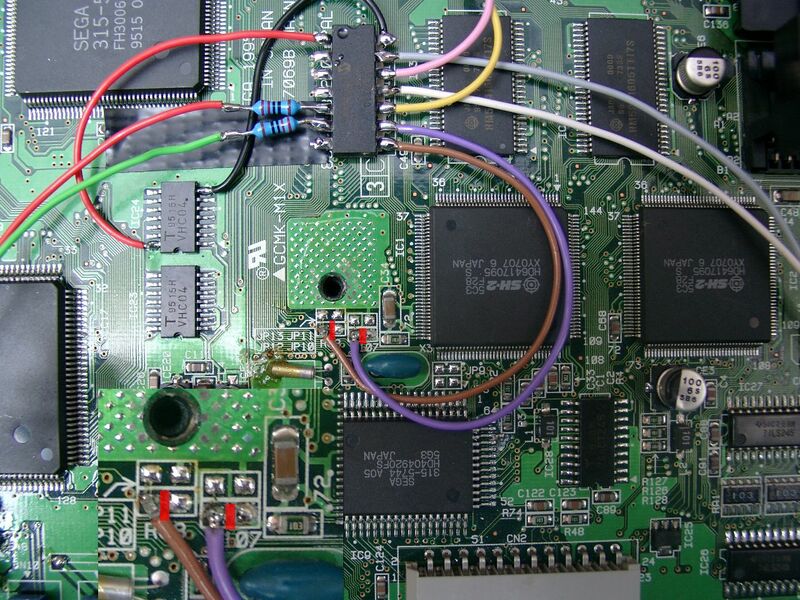 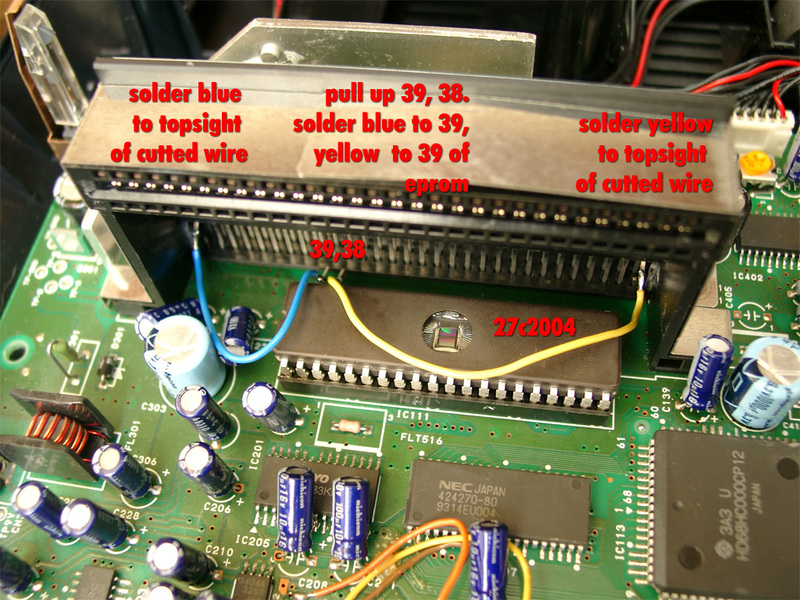 For Sega CD support you have to cut Pin A01 (yellow wire) and Pin A30 (blue wire) of the Genesis Expansionsport and solder the 2 wires to the PIC Pin 10 blue and PIC Pin 8 yellow. 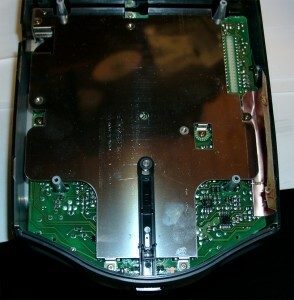 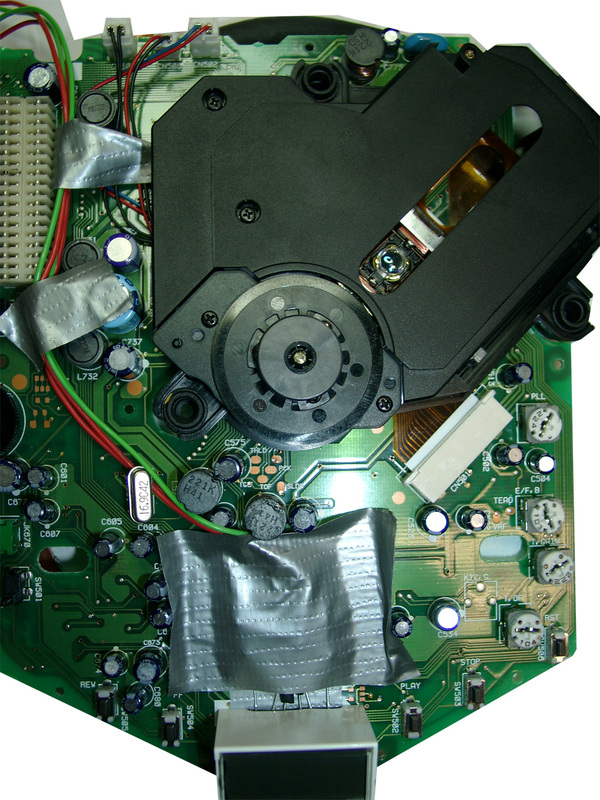 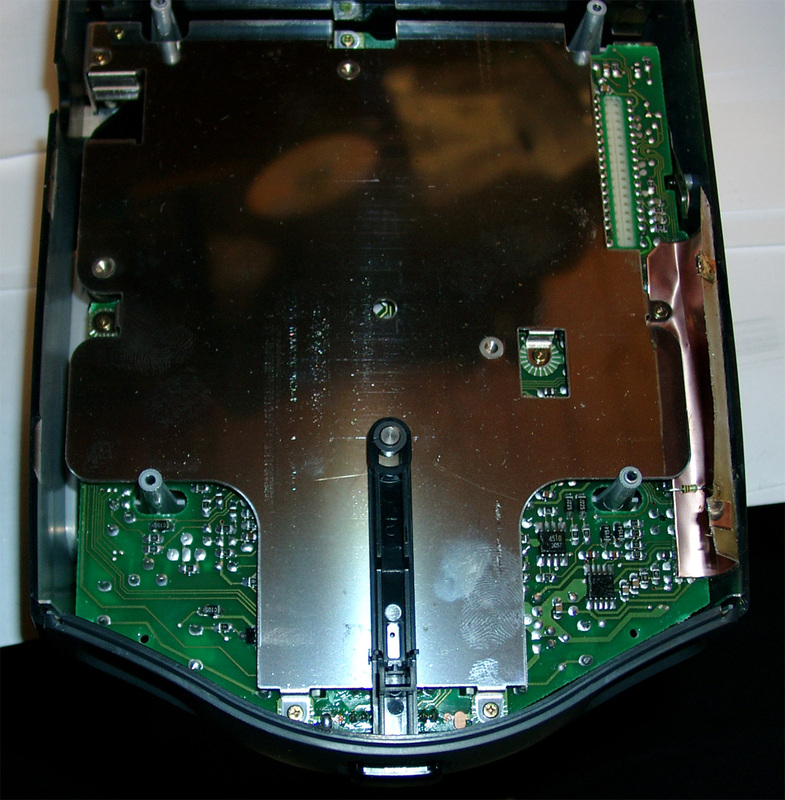 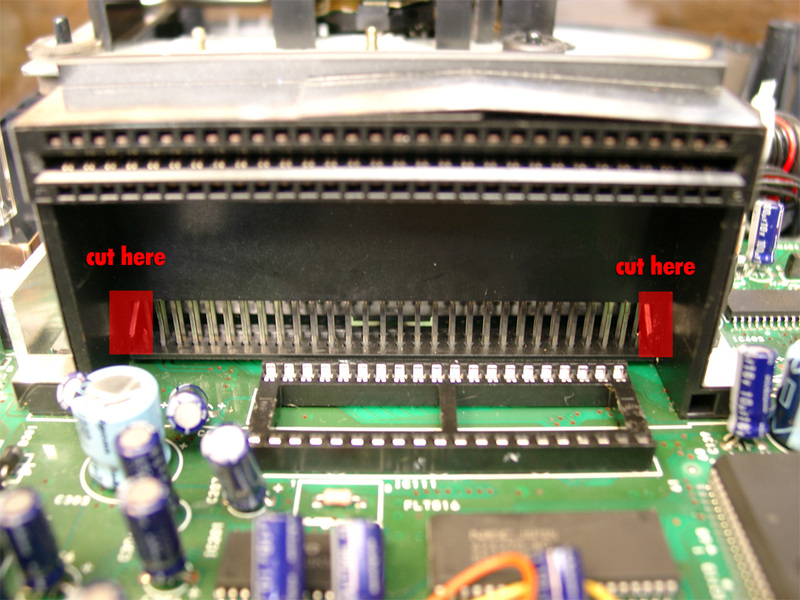 First you have to open the 32X and remove the shielding. The only protection of the 32X is the 50/60Hz settings. 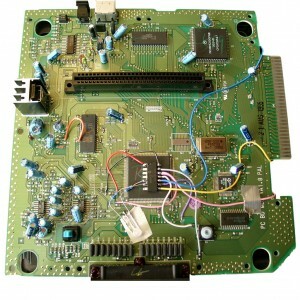 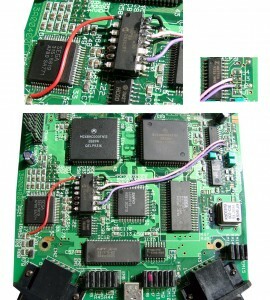 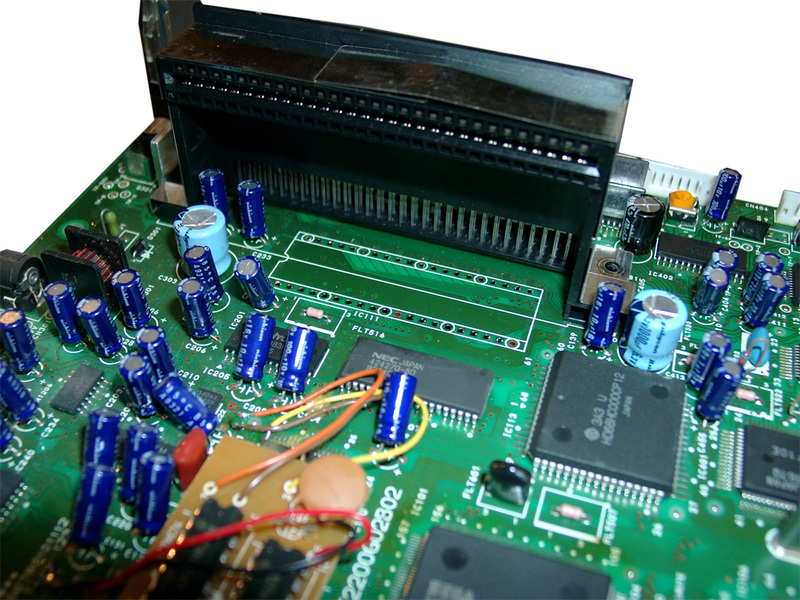 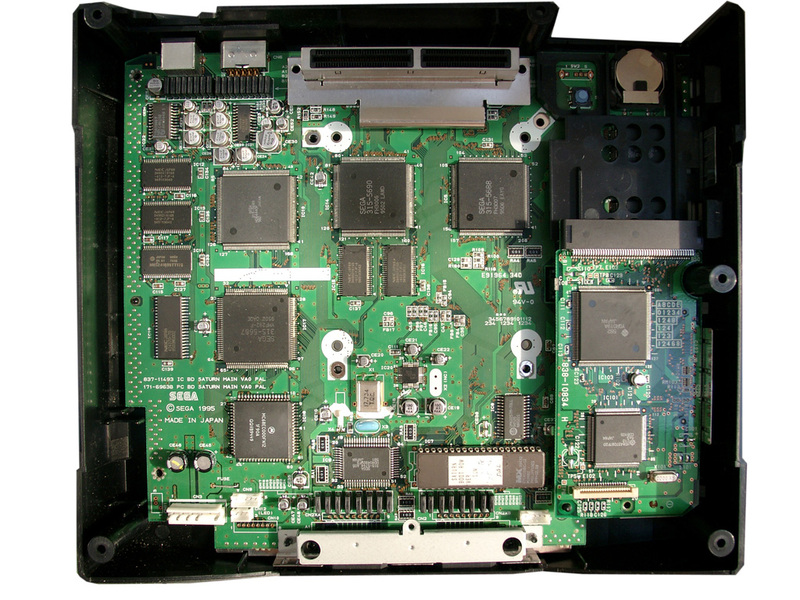 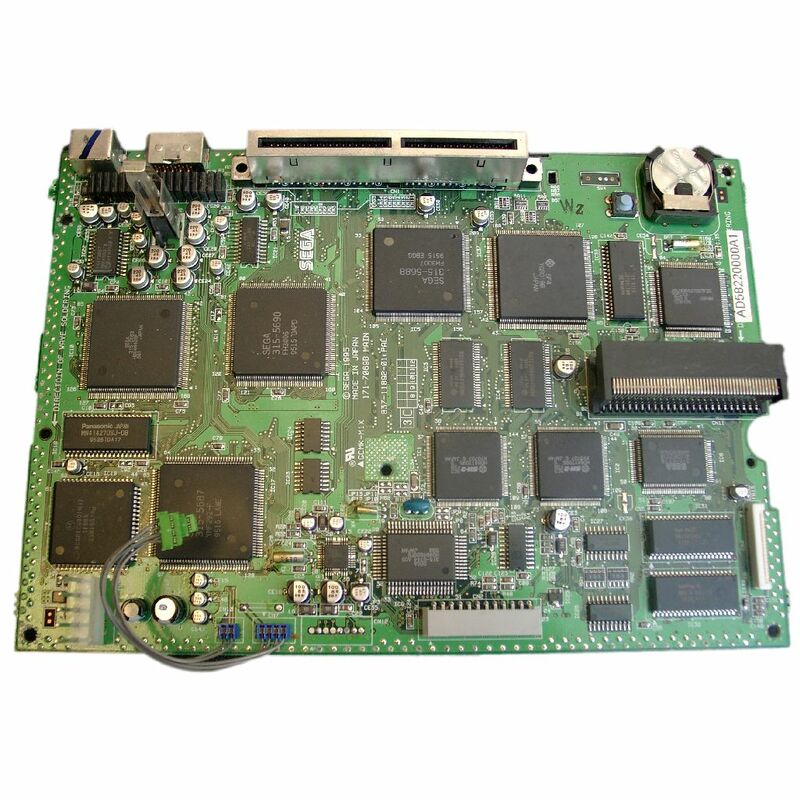 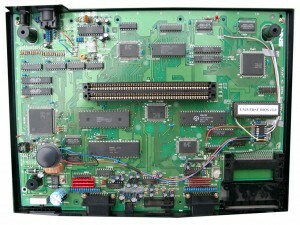 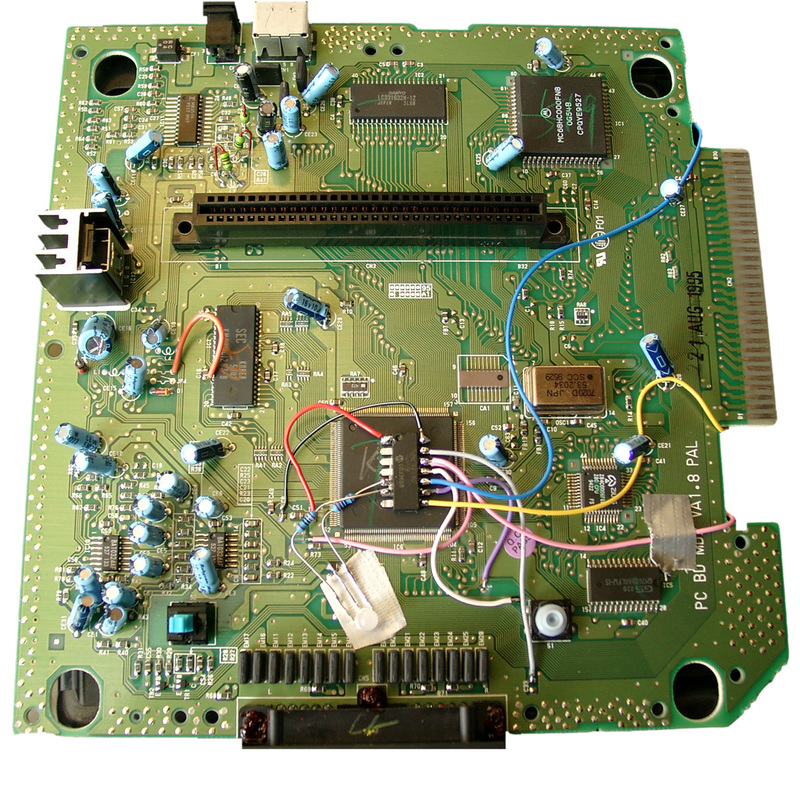 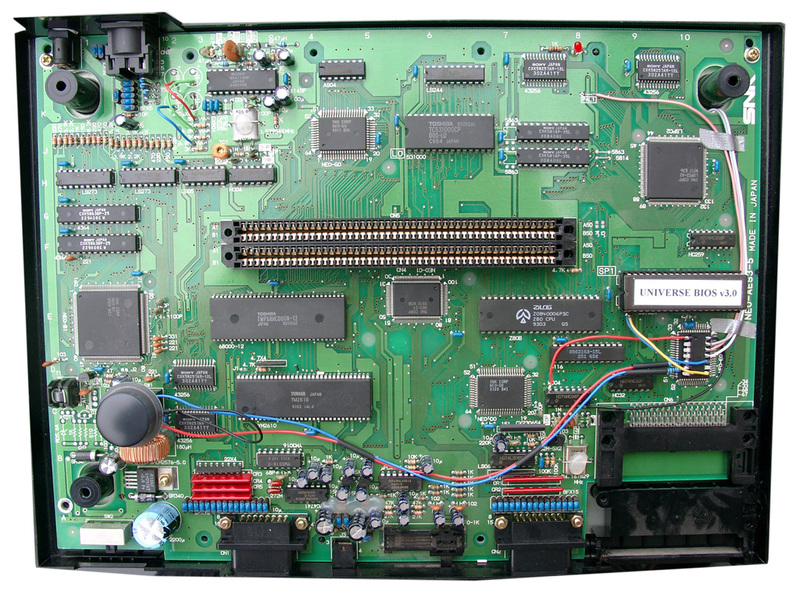 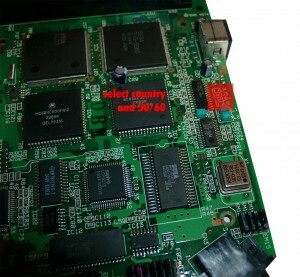 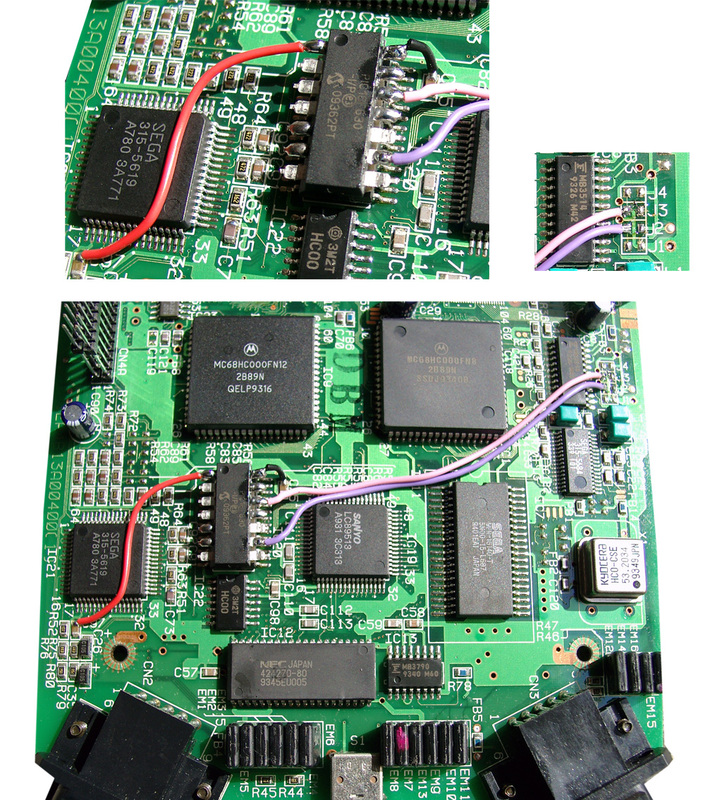 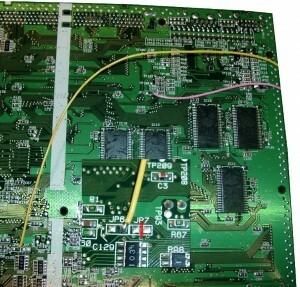 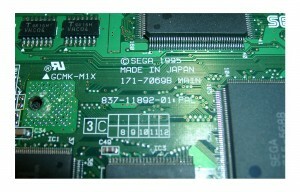 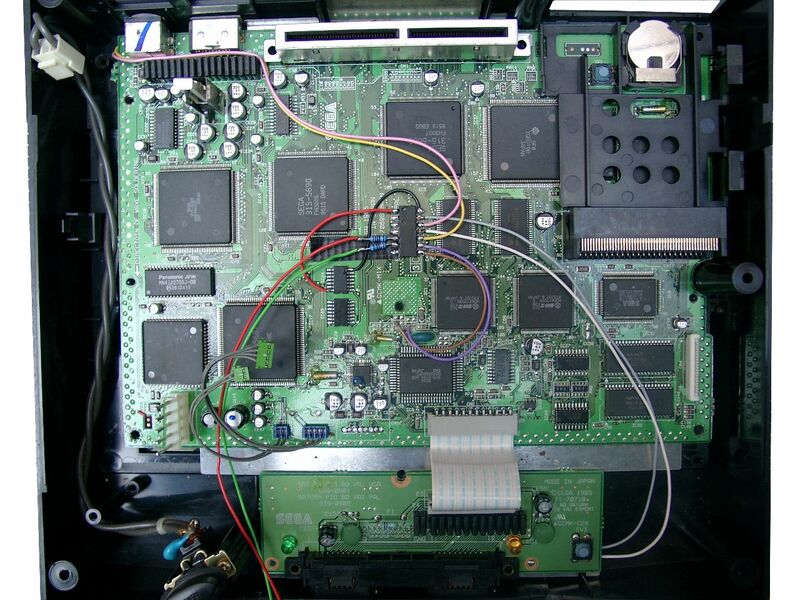 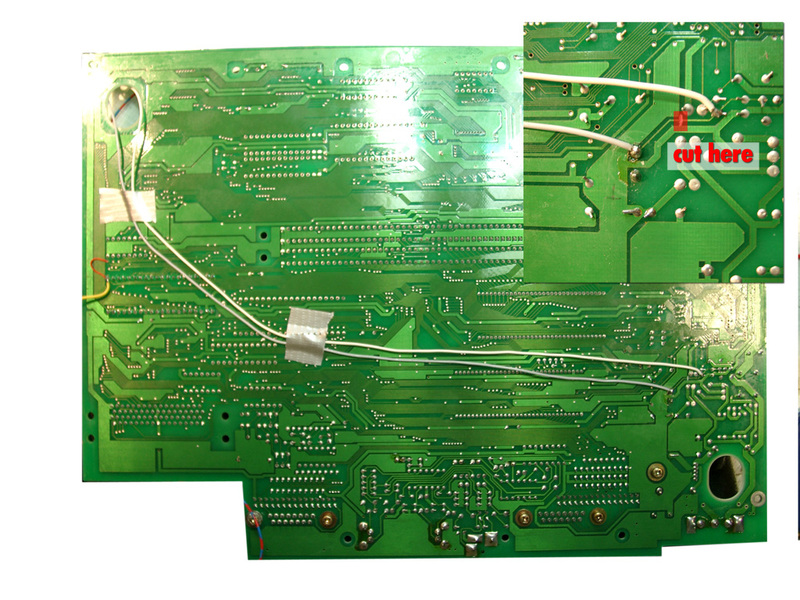 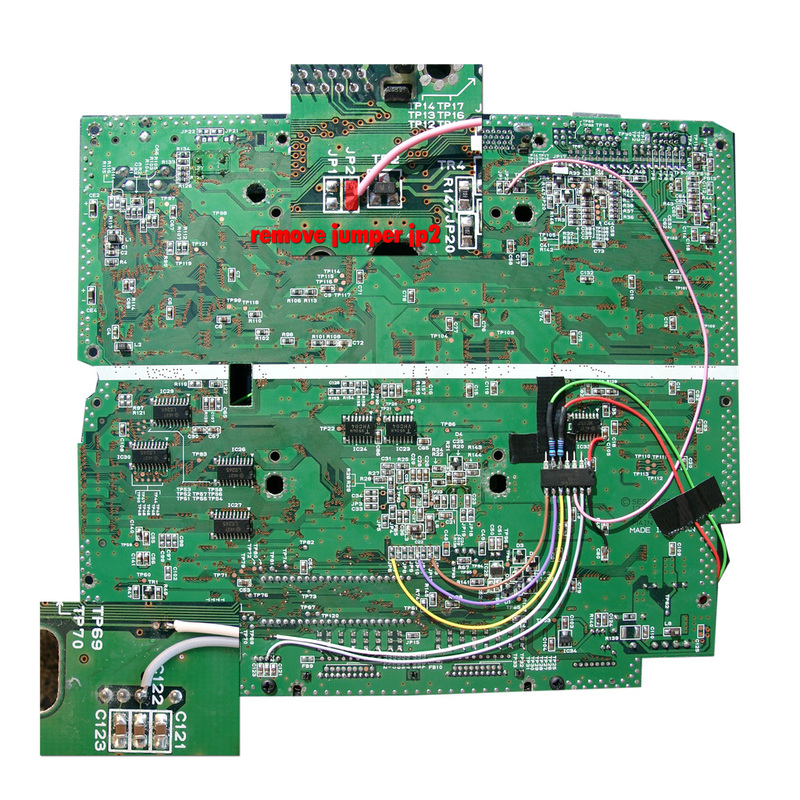 You will find it at the right site of the mainboard IC12 SEGA 315-5788. 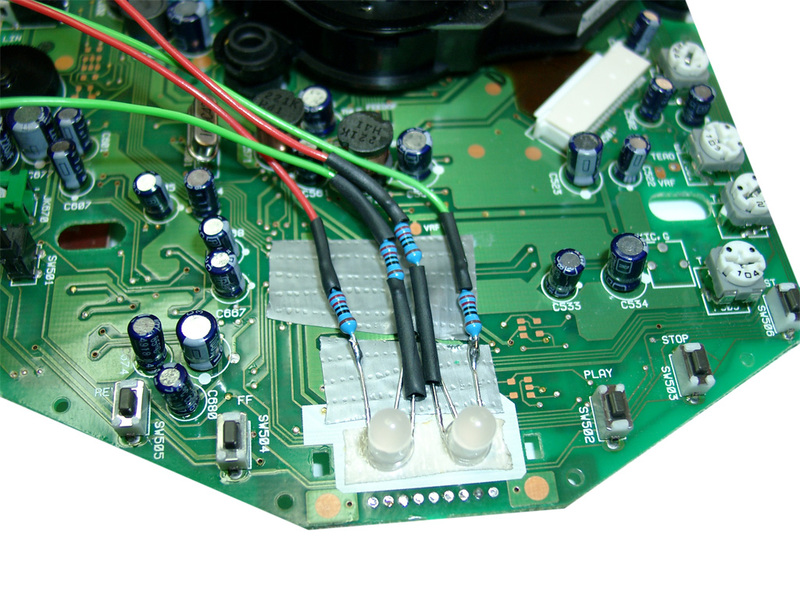 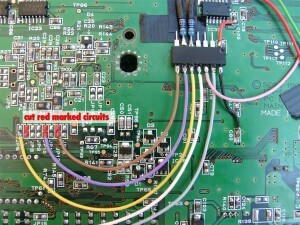 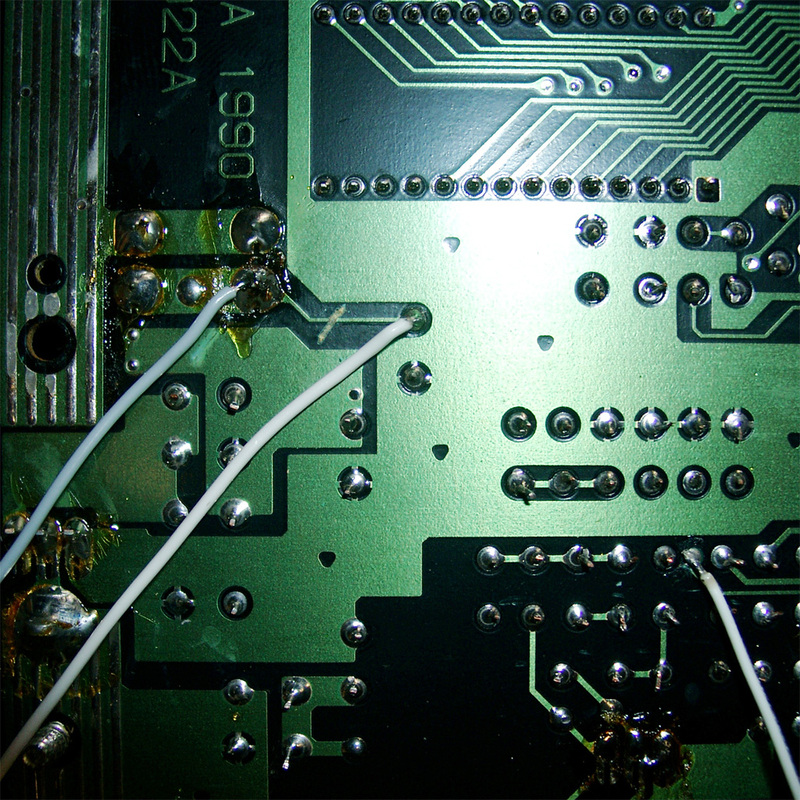 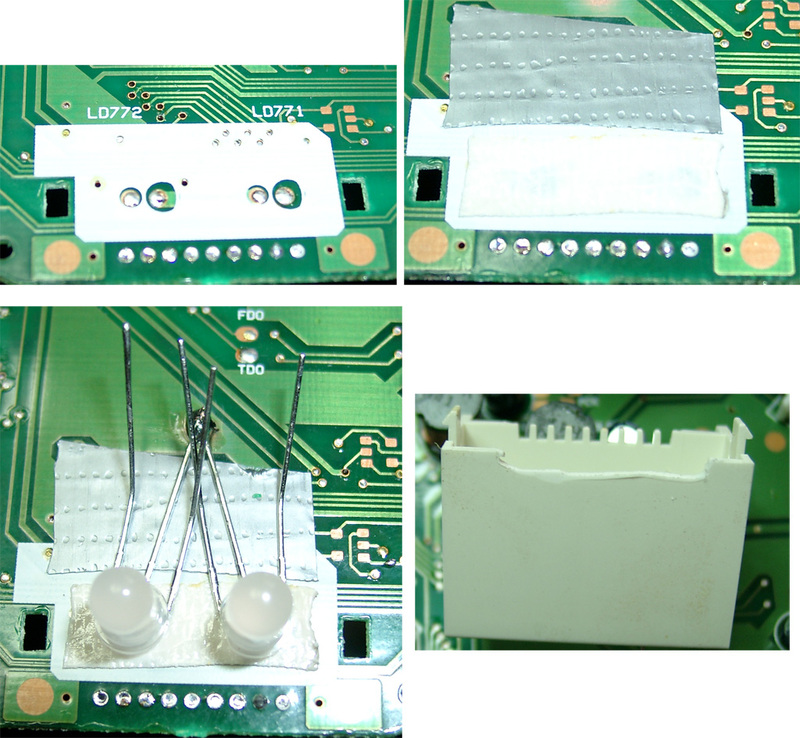 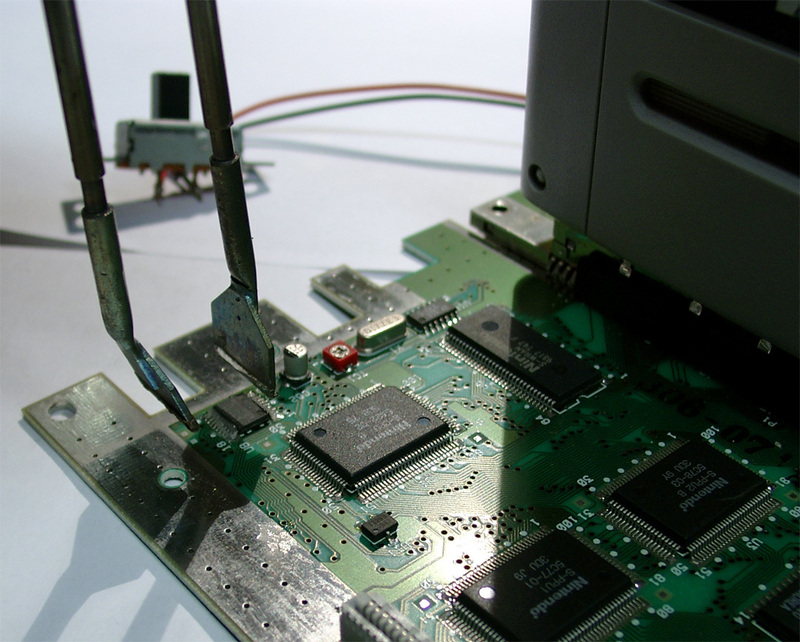 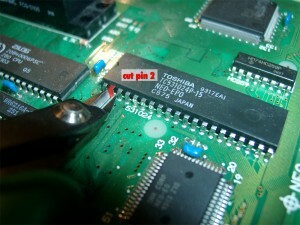 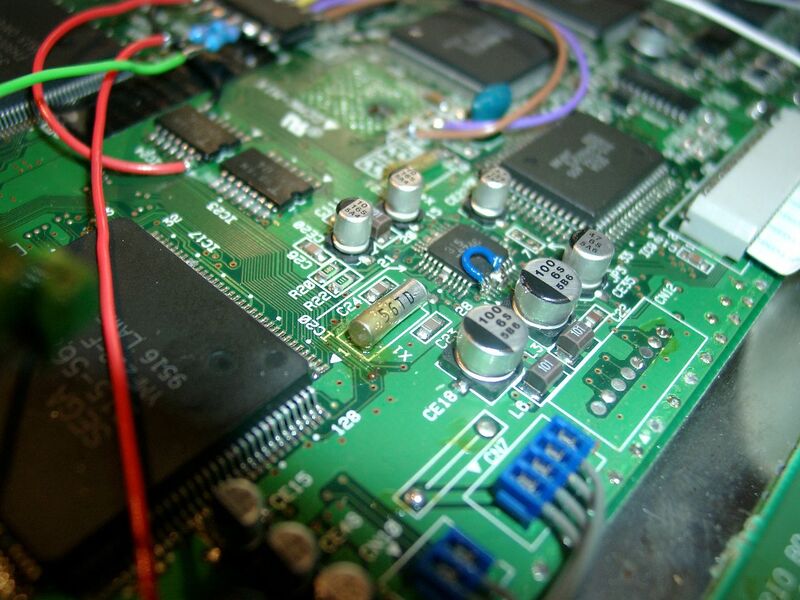 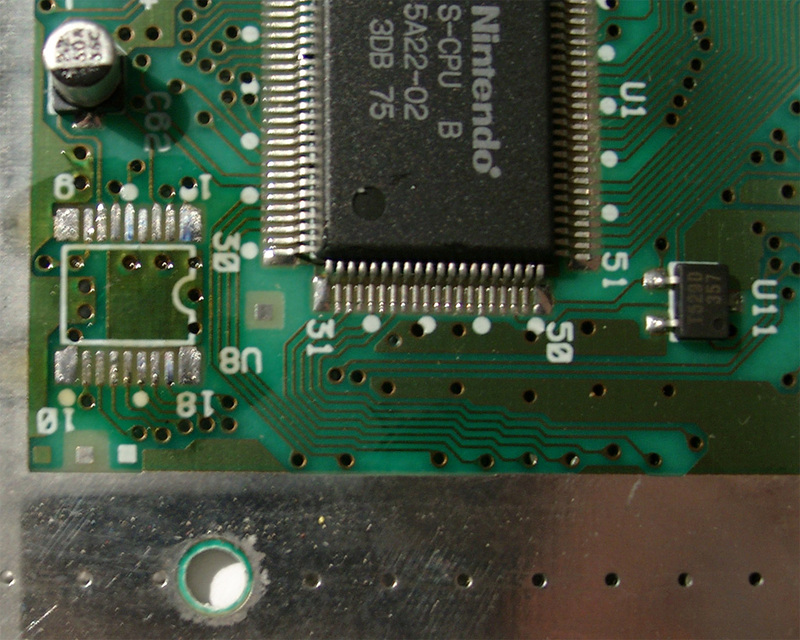 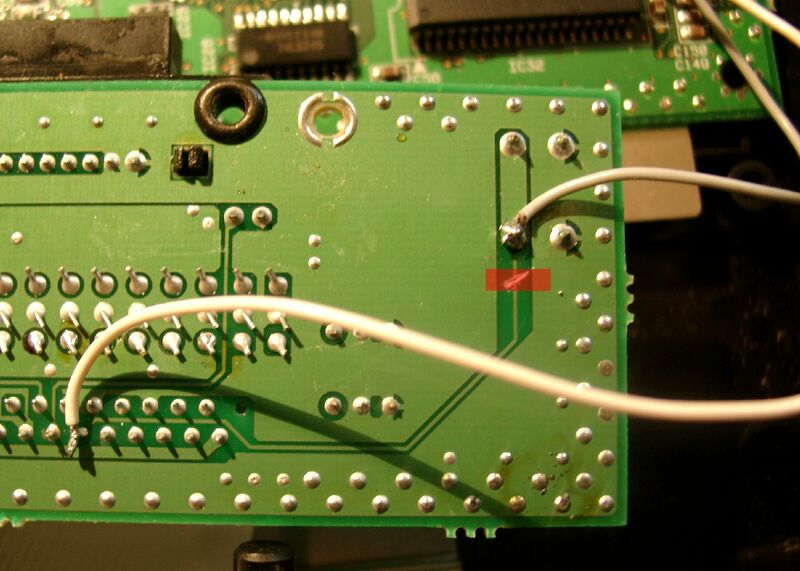 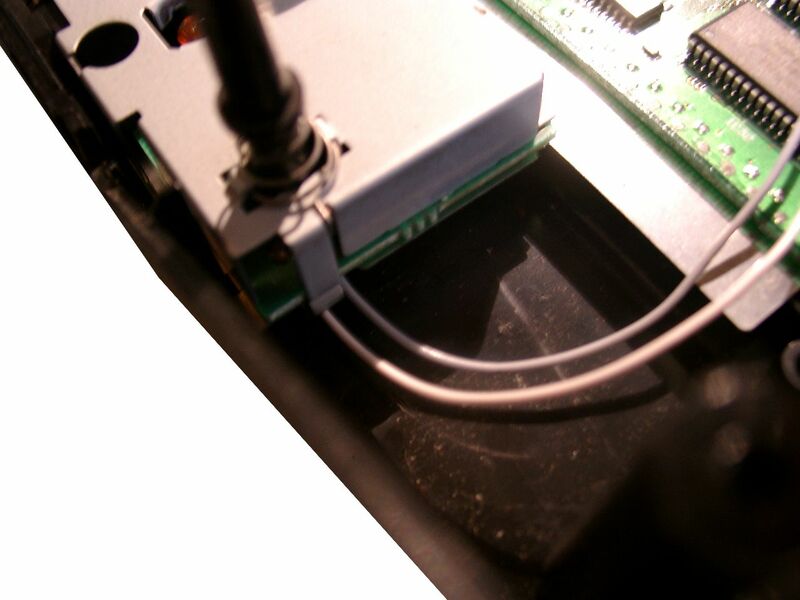 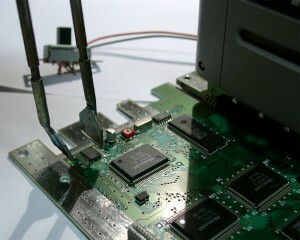 On the solder site you will have to Cut the cirquit path to Pin 6 of the A/V Port. 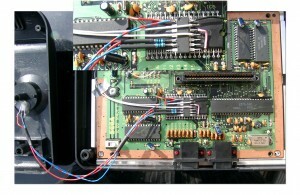 Pin A01 and A30 of the Expansionsport carrying GND. 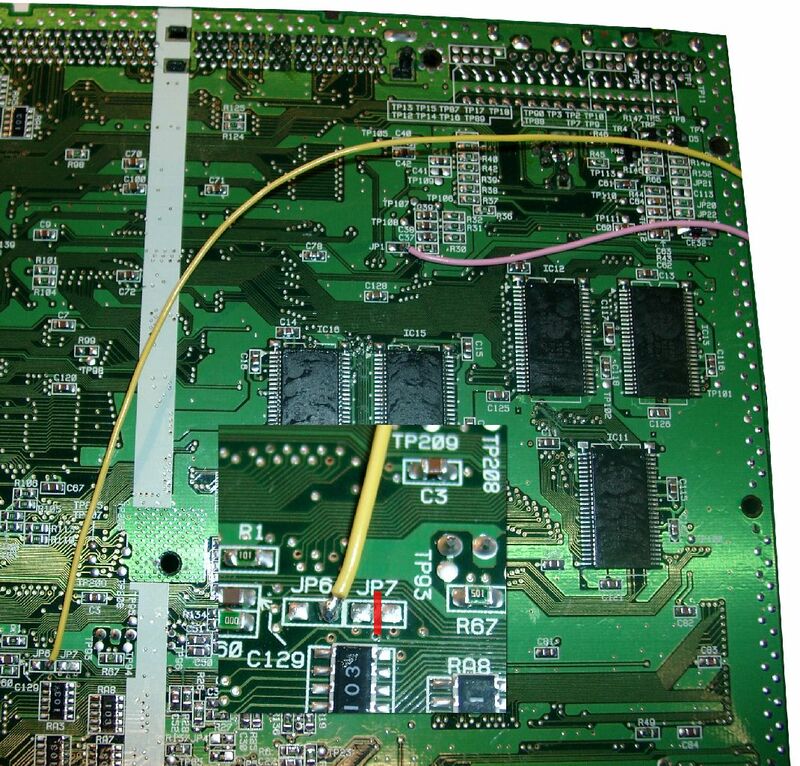 There are many ground Signals at the Expansionsport. 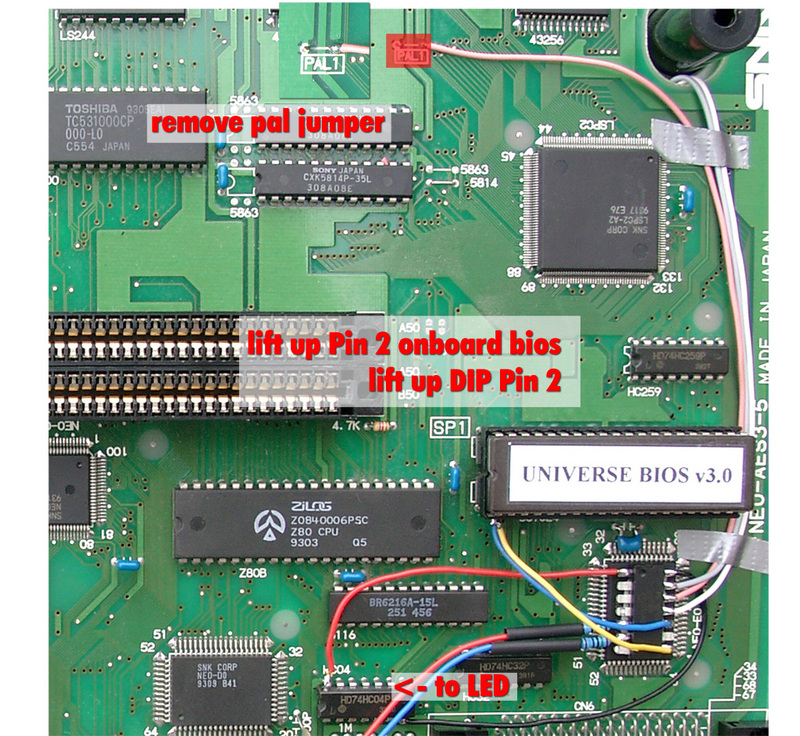 So we can cut these two of and make use of the free Pins for the Bios select.